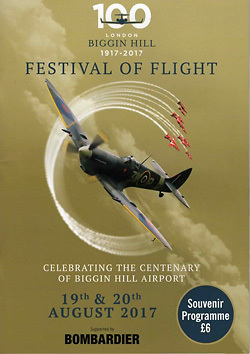 The airfield at Biggin Hill celebrates its 100th Anniversary in 2017. 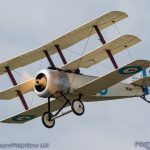 On 13th February 1917, the War Office opened a military camp for as a communications facility. 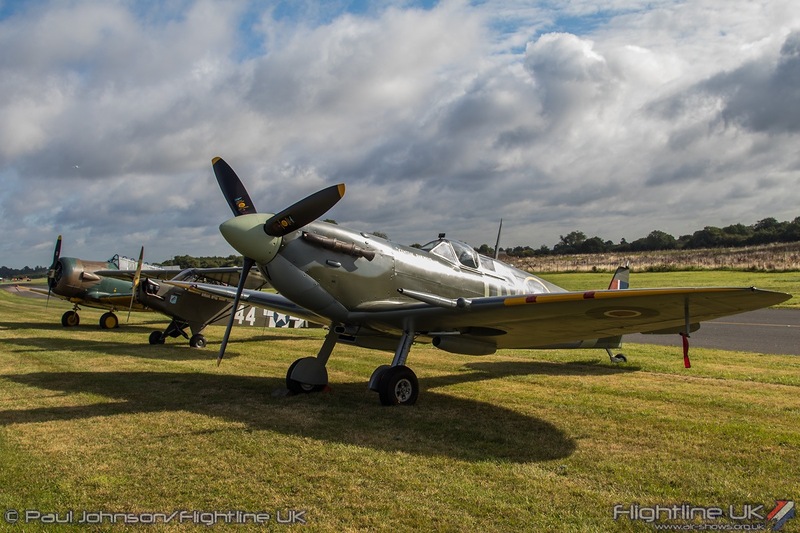 100 years on, the site is now London Biggin Hill Airport and a thriving centre for business aviation. 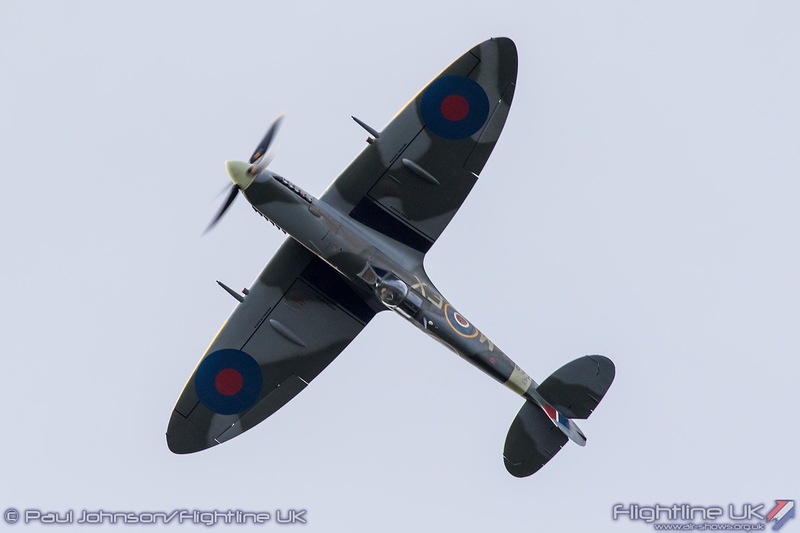 As such, Biggin Hill still plays an important role in the prosperity of the UK as a gateway to London. 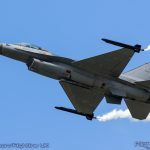 The major public celebration of this anniversary was the annual Festival of Flight which moved from its traditional June date to August. 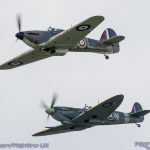 Biggin Hill is most famous as a sector station during the Battle of Britain. 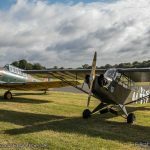 The stories from 1940 of the Kent airfield perched on the North Downs are legend and still play an important part in local community life. 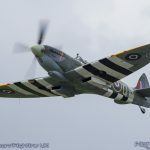 Reminders of the Royal Air Force, its aircraft and personnel are kept alive through the names of local businesses and road names in the area. 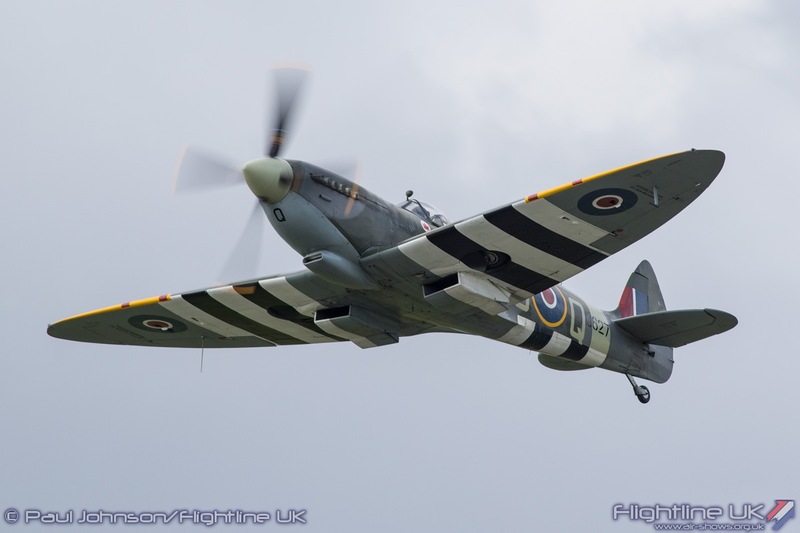 The original RAF camp is also still in existence on the western side of the airfield preserving the memories of this famous airfield. 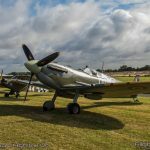 For those that follow airshows, Biggin Hill is equally as famous for hosting some of the most memorable airshows. 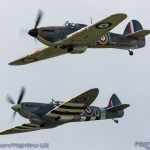 As an RAF airfield, it regular hosted “Battle of Britain At Home Days” but is perhaps best known as the home of the International Air Fair. 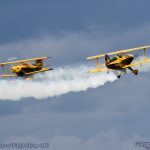 The “Air Fair” was perhaps the biggest and most important annual civilian airshow on the calendar. 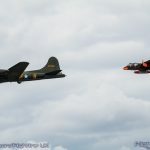 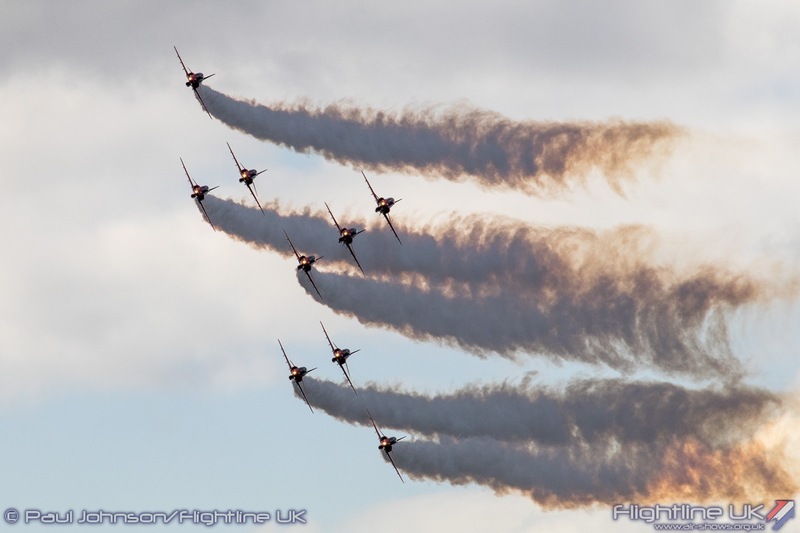 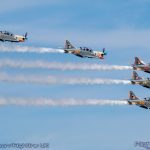 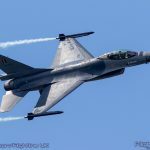 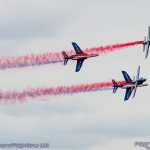 Though it was started by the late great Jim Maitland as a means of promoting air travel, it soon became the pinnacle of airshow excellence bringing together all facets of aviation from the military, commercial and civilian aviation worlds. 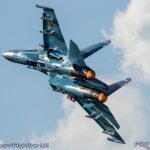 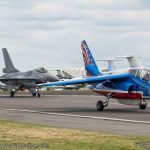 There was no other airshow that could bring together rare aircraft like the Test Pilots Sukhoi Su-27 flown by Anatoly Kvotchur, the incredibly rare Dornier Do-24ATT, low passes by the Boeing 707s and Douglas DC-10s of Das Air, massed formations of Spitfires and Hurricanes, the four-ship of Orange Airships, Slovakian Air Force MiG-29s, USAFE F-111s, Vulcan XH558 ripping up the tarmac in its last RAF flying season, Christian Moullec flying a microlight in formation with Geese, the Confederate Air Force’s B-24 Liberator and so on. 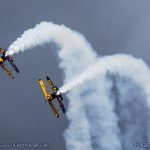 When, very sadly, the Air Fair came to an end after the 2010 show, there was nothing that could ever replace it. 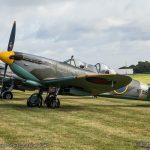 While there was a small air display as part of an Open Day in 2011, it was not until 2014 that airshows really returned to Biggin Hill with the Festival of Flight. 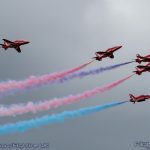 For the past three editions, these have been single day event held in June coinciding with the Queen’s Birthday Flypast over London. 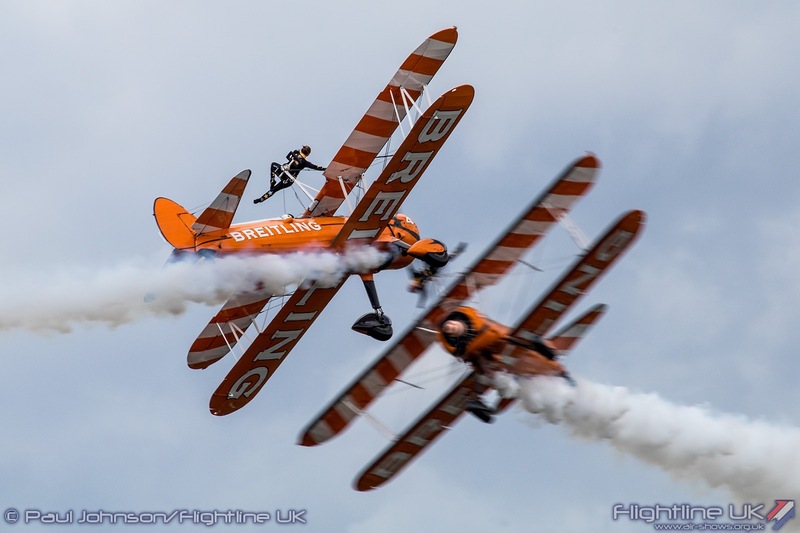 The Festival of Flight is a smaller event that the Air Fair, but retains much of the spirit of the previous event with a very varied but more relaxed flying display. 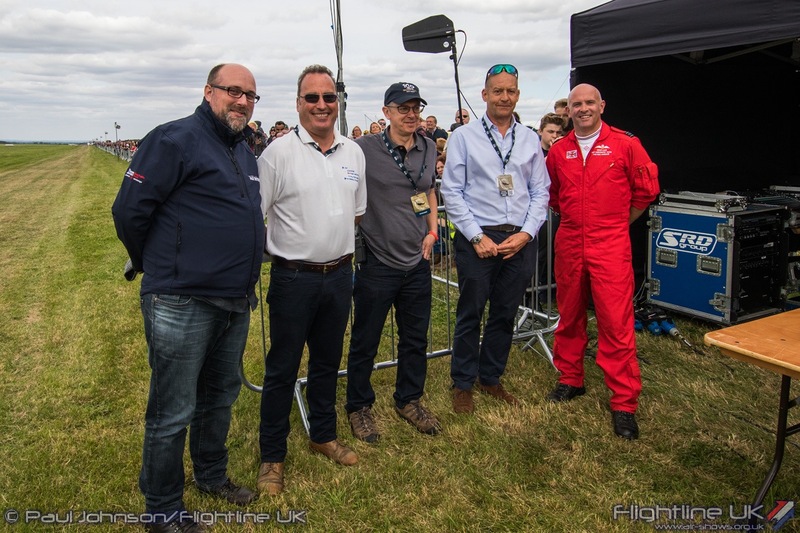 To celebrate the airfield’s centenary, the Airport moved the Festival of Flight to a mid-August weekend and expanded the event to two days. 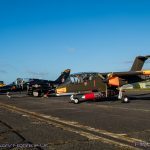 This not only allowed the event to share acts with other major events, but also took advantage of what is generally a slightly quieter period for the business orientated airport being mid-holiday season. 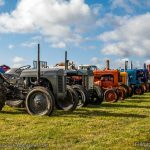 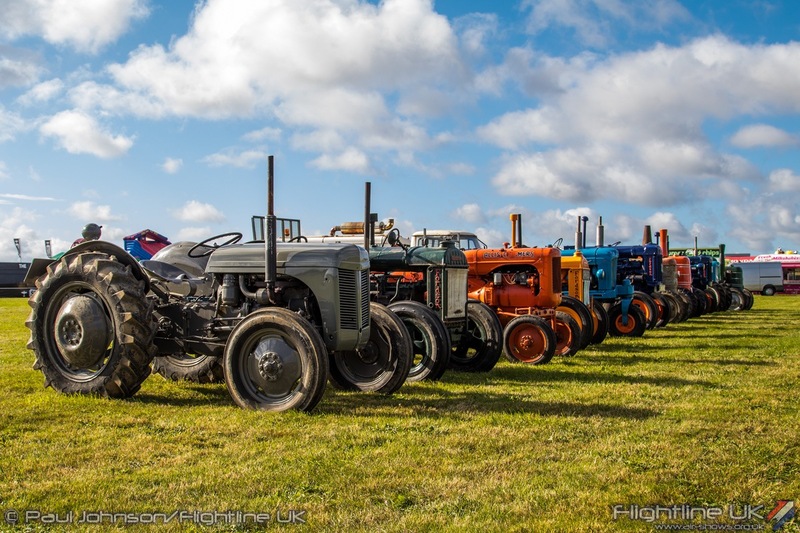 On the ground, there was an uncluttered showground which included the usual trade stalls, Classic and Super cars from the Roundel Run, vintage tractors and a few military vehicles. 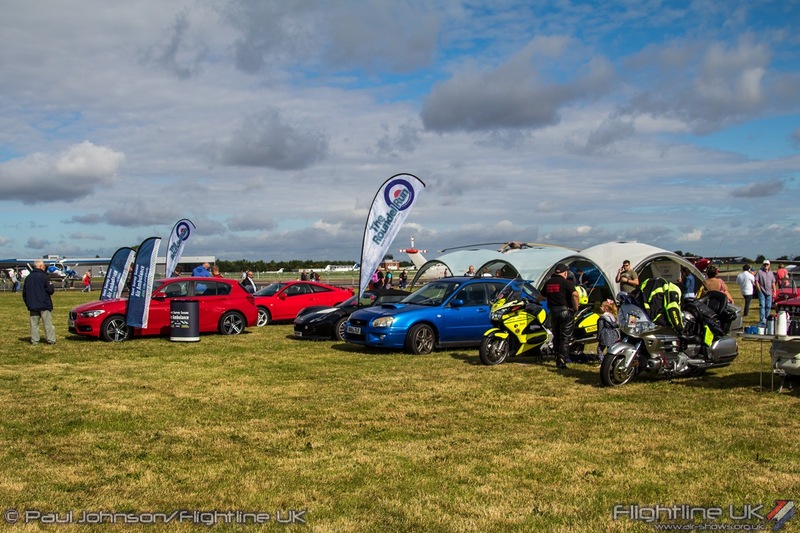 A central “Biggin100” exhibition space celebrated the history of the airfield along with some famous “time-machines” such as Doctor Who’s Tardis and a “Back to the Future” inspired De Lorean car. 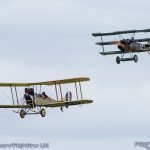 The aviation element was every bit as varied as you’d expect from a Biggin Hill flying display and covered over 100 years of flight. 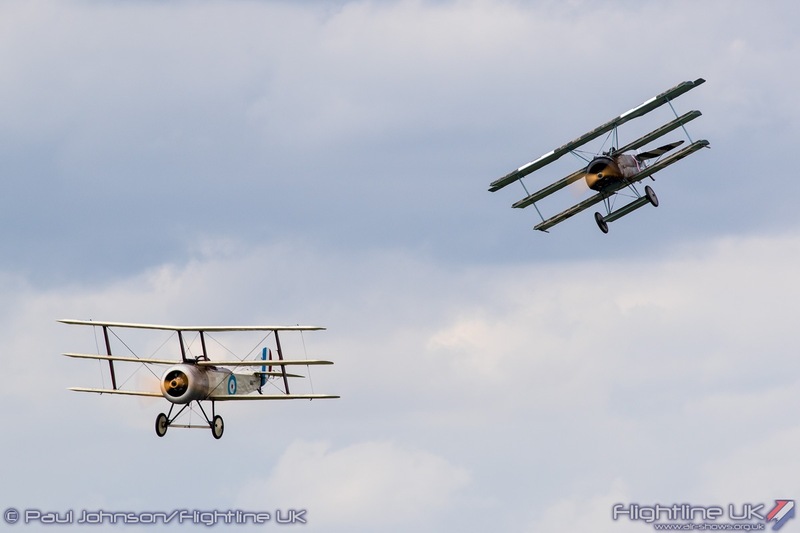 Biggin Hill’s First World War origins were represented by the Great War Display Team. 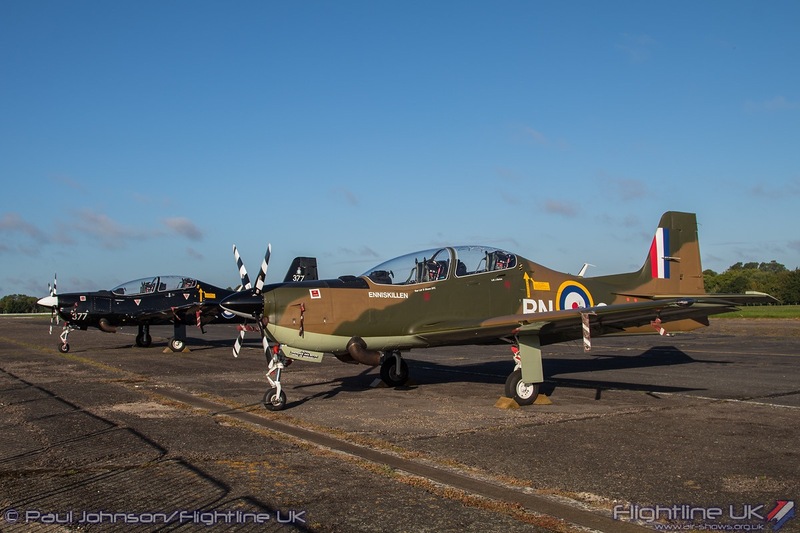 Operating from nearby Redhill Aerodrome due to the need for Grass runways, the team filled the skies with a recreation of early air combat. 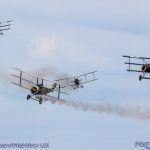 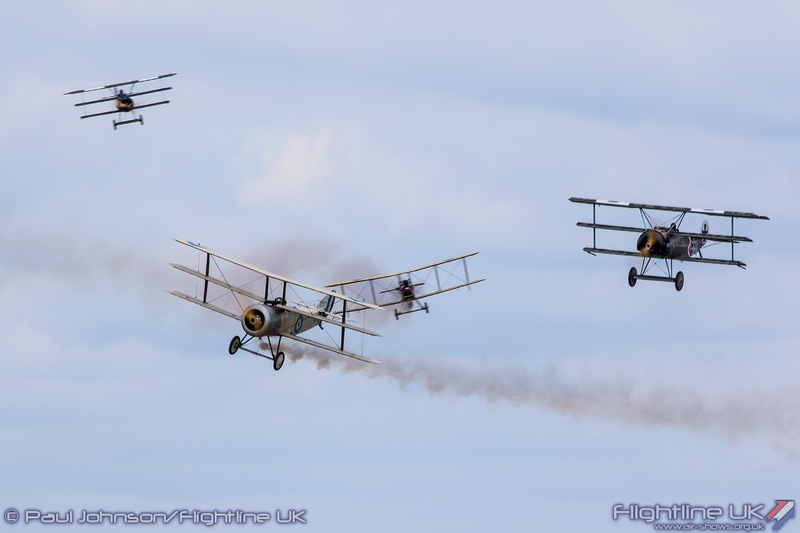 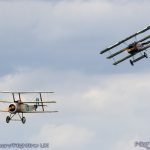 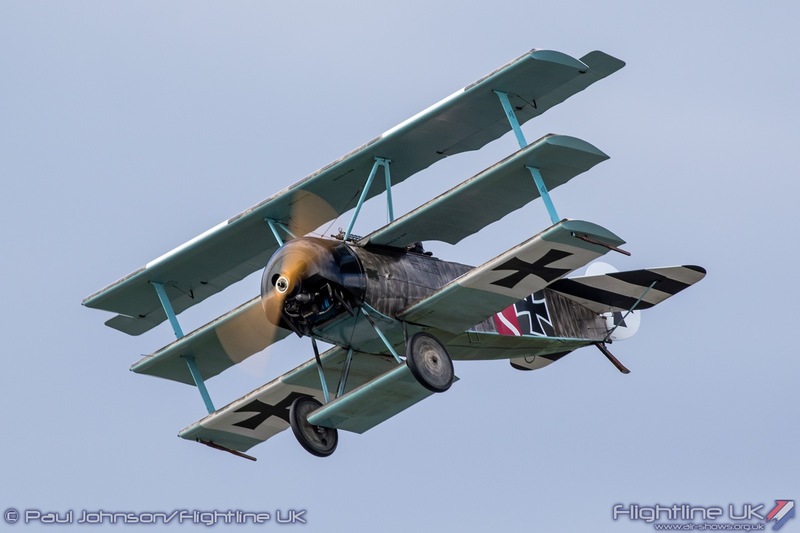 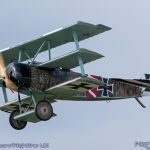 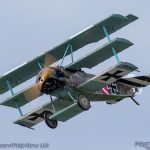 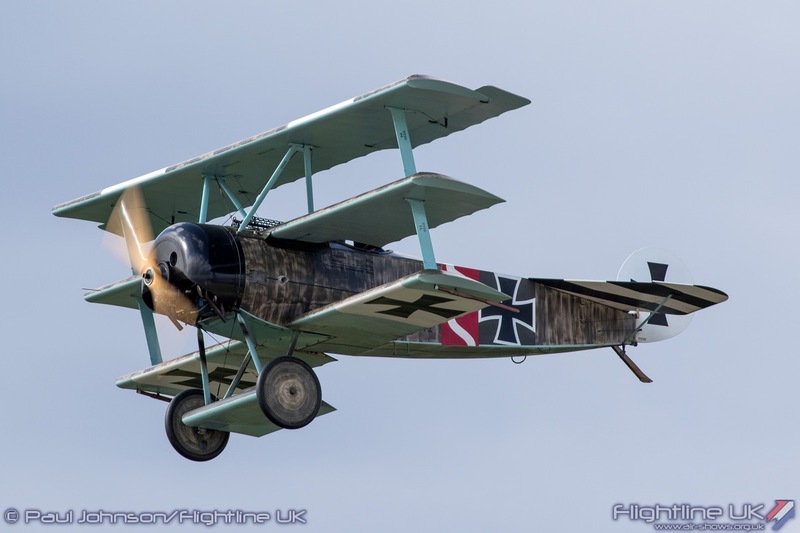 Six aircraft made the Saturday display despite some gusty winds with the Sopwith Triplane, a pair of RAF SE5as, a Junkers CL1 plus a brace of Fokker Dr1s swirling around the display area. 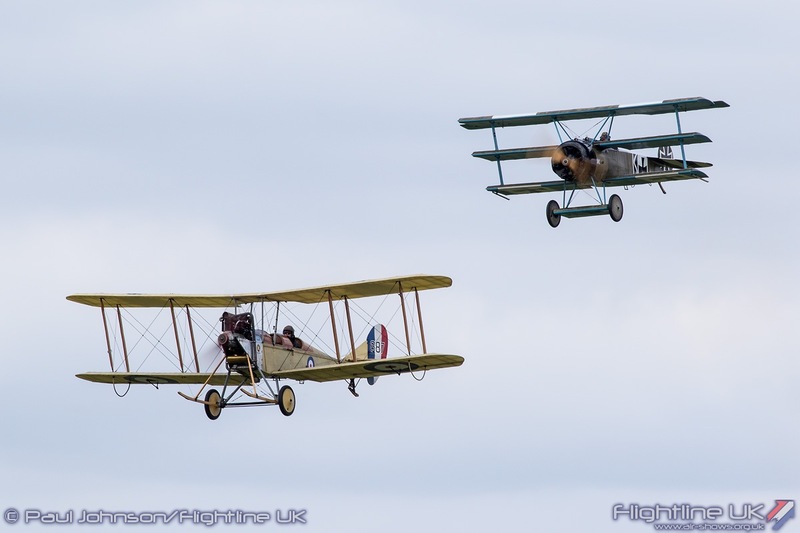 Sunday saw the RAF BE2c added to the line-up as the winds dropped. 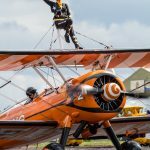 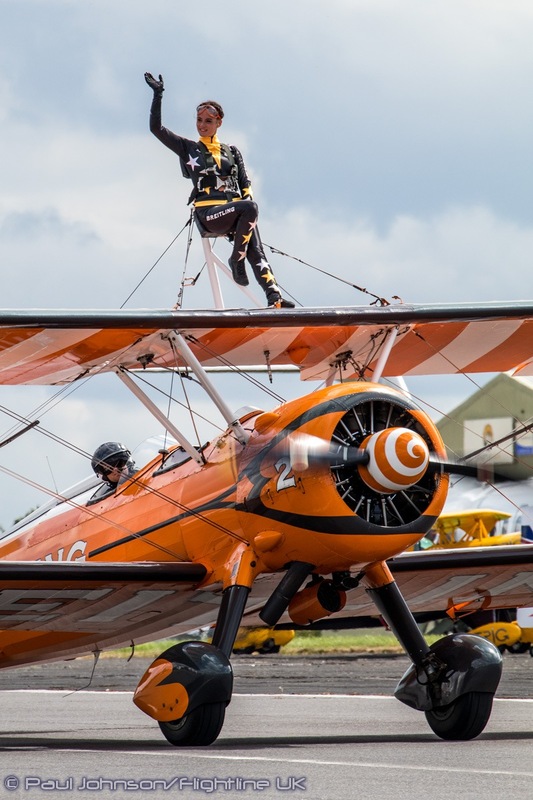 No Biggin Hill event would be complete without the Breitling Wingwalkers and their Boeing Stearman. 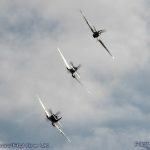 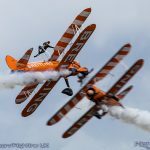 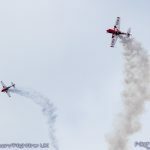 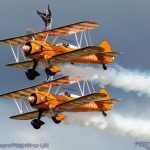 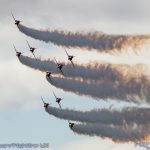 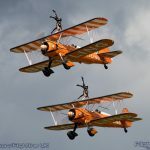 The team have long supported Air Fairs and other events at the Kent airfield with their punchy formation routine that always draws “ooo-s” and “arr-s” from the audience. 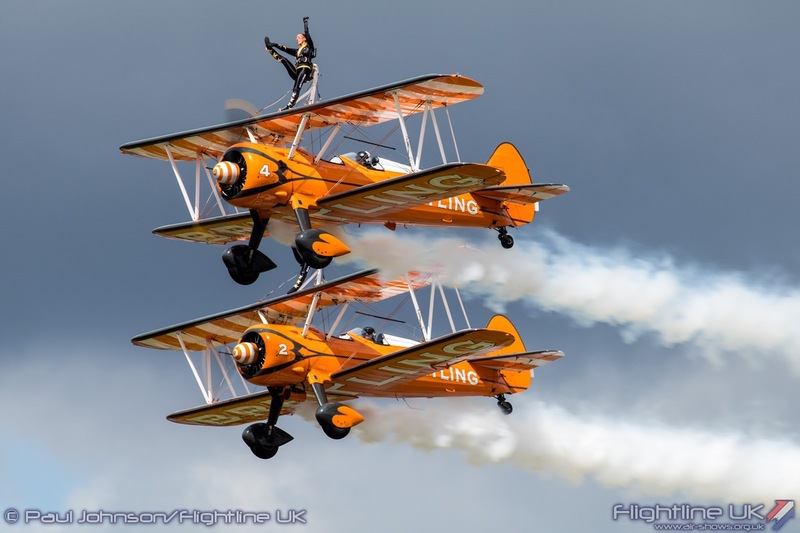 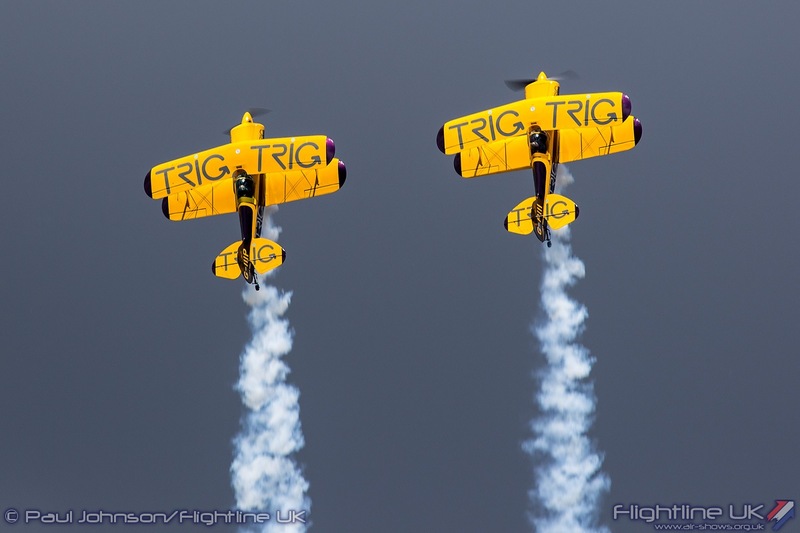 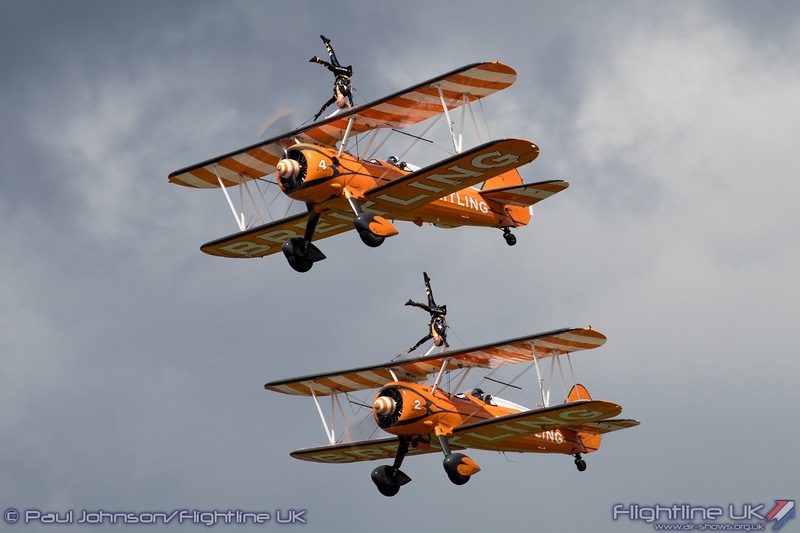 More biplane fun came from the TRIG Aerobatic Team with their Pitts S-1D Specials. 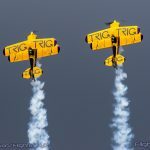 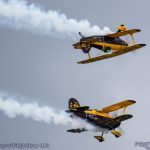 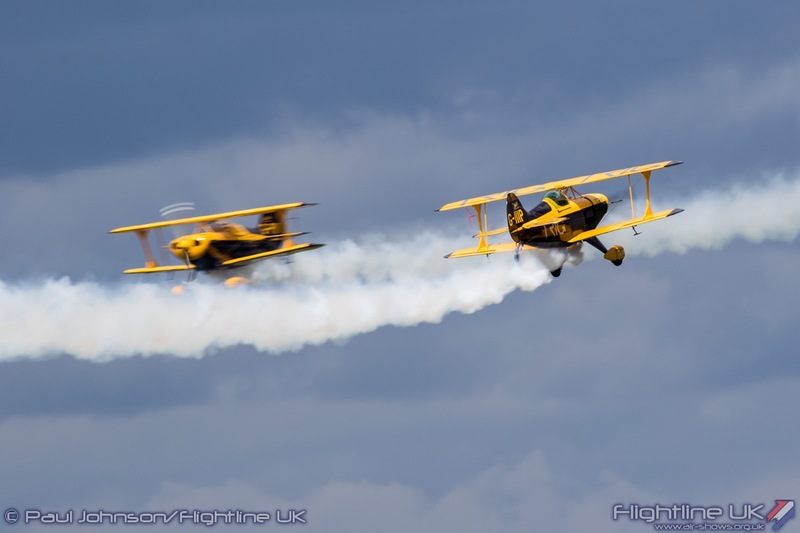 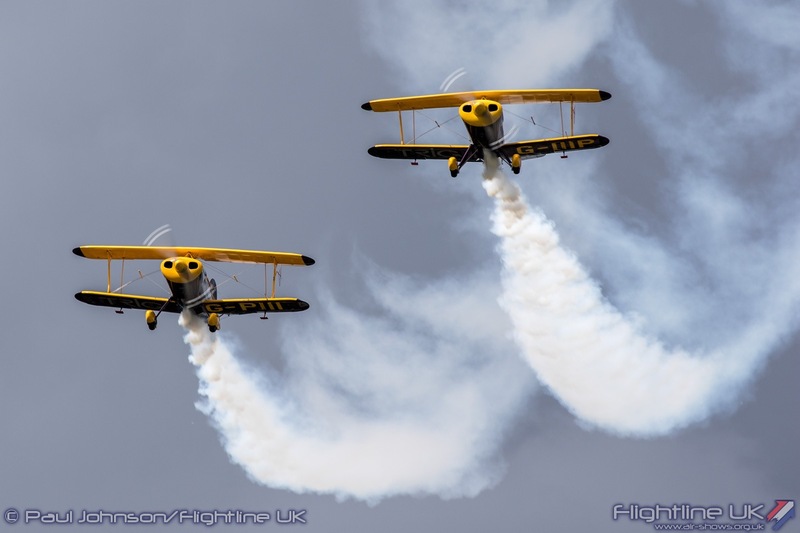 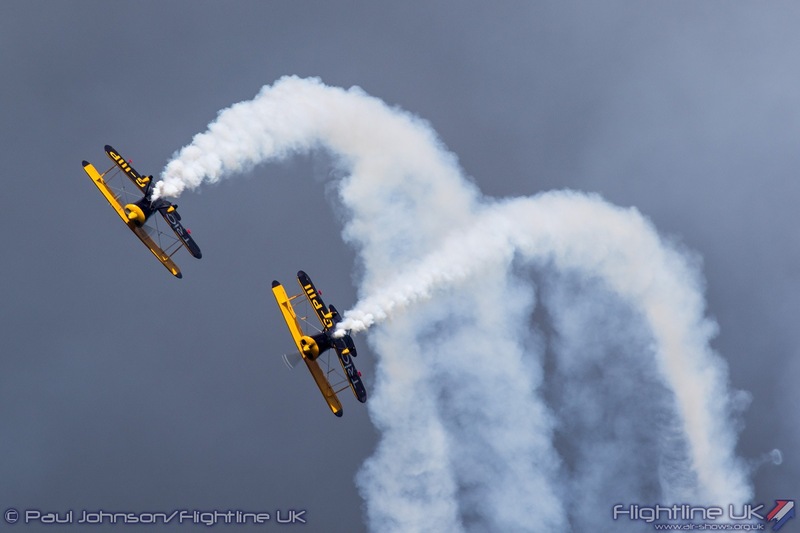 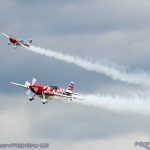 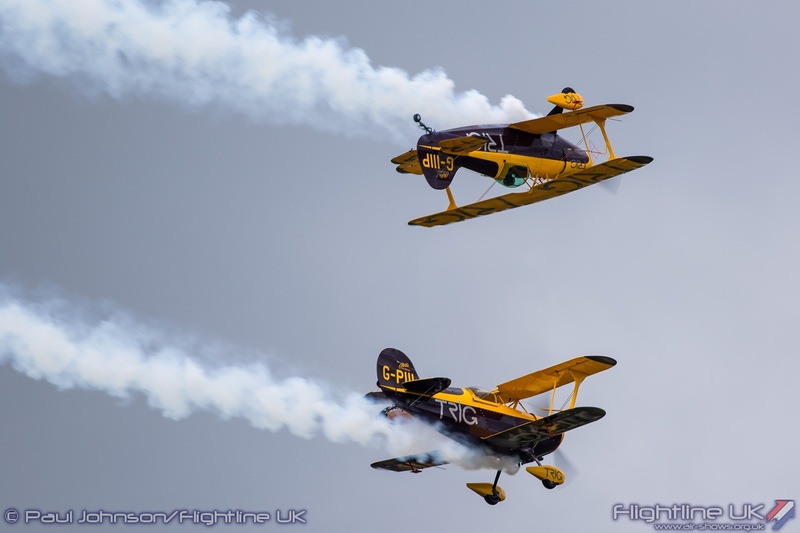 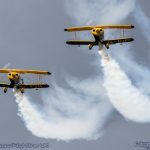 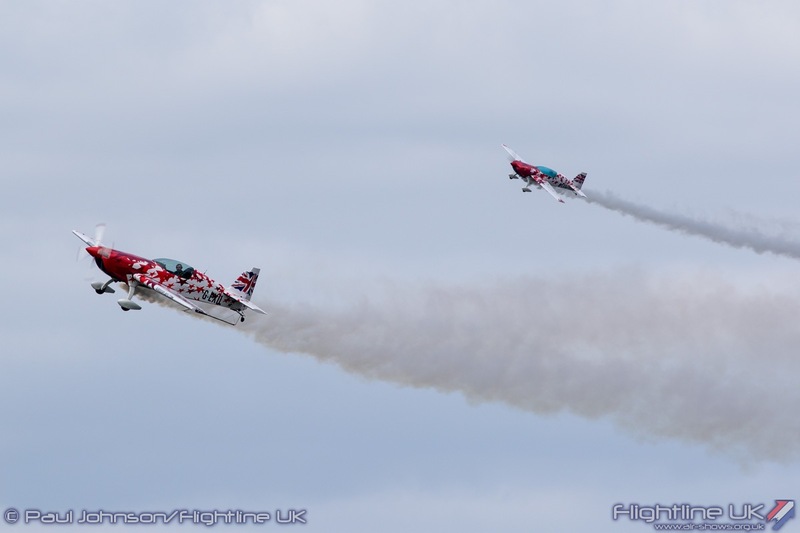 Richard Grace and Dave Puleston’s displays over the weekend were a worthy tribute to the many Pitts based display teams such as the Rothmans Aerobatic Team and Team Toyota which were regular fixtures throughout the history of the Air Fair. 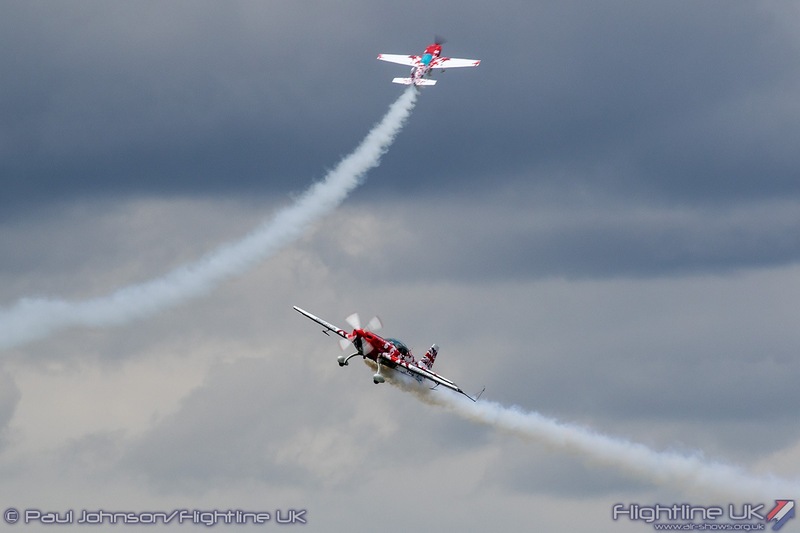 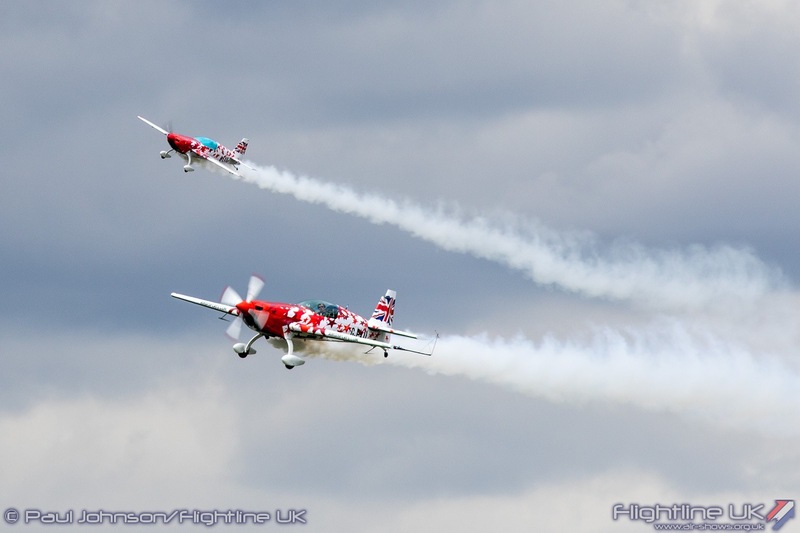 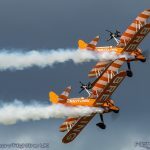 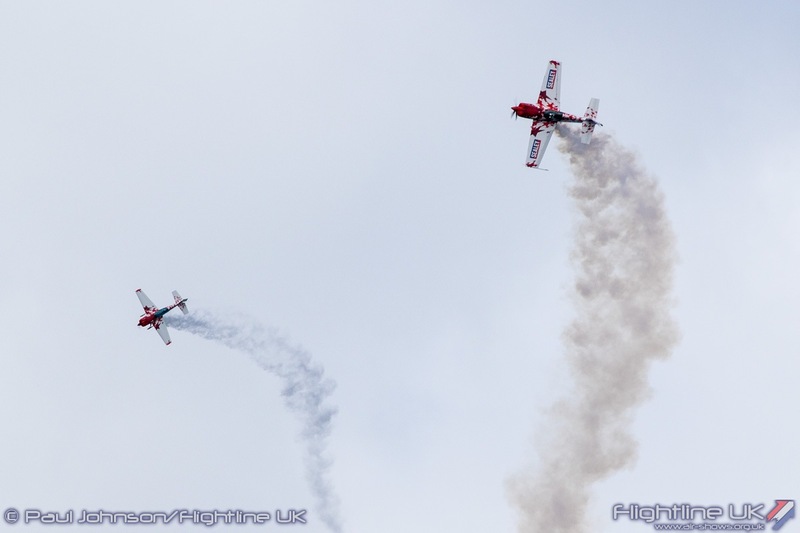 A relative new act to Biggin’s skies is the Extra ‘Little and Large’ Duo from G-Force Aerobatics. 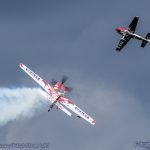 The duo sees Champion radio-controlled model pilot Mike Williams flies his scale Extra 300S model through a perfectly synchronised routine with Chris Burkett flying his full sized Extra 300S. 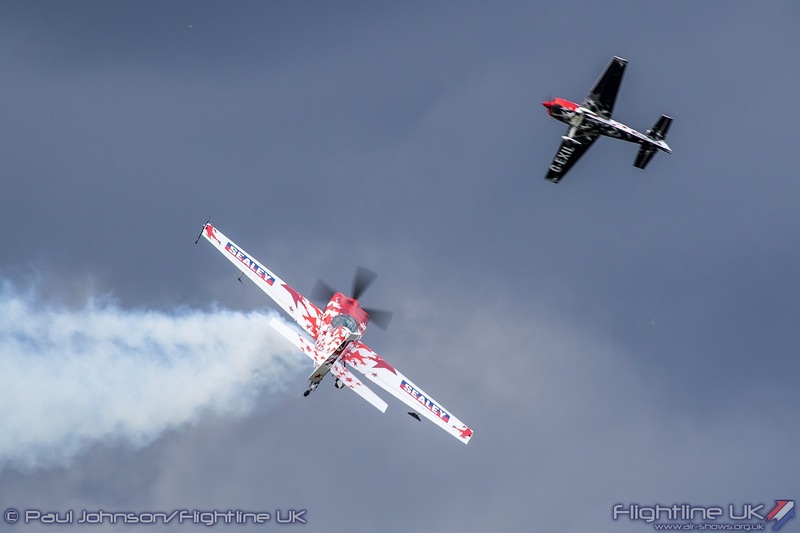 For 2017 both aircraft wear the Global Stars colour scheme which really does stand out on a sunny day. 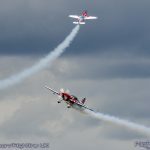 Their routine never ever ceases to amaze as the two aircraft fly so well together and you can often forget that one aircraft is a model being flown from the ground. 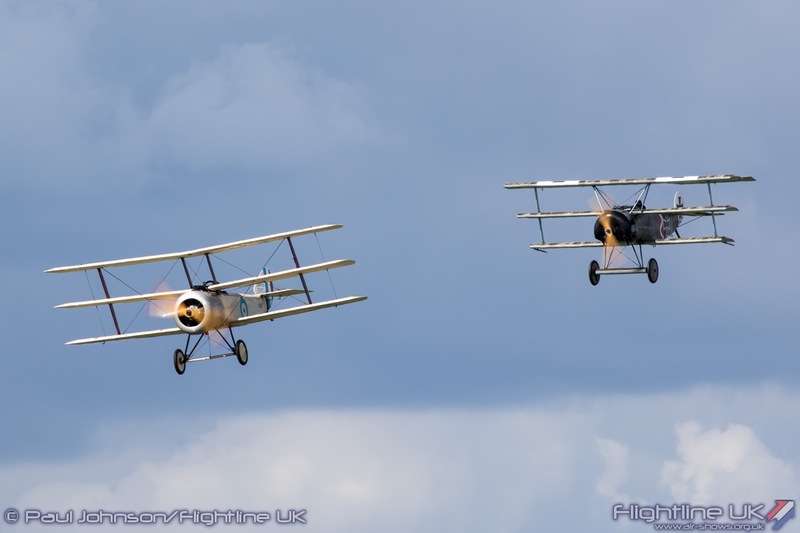 As always, the static and flying displays featured many historic aircraft. 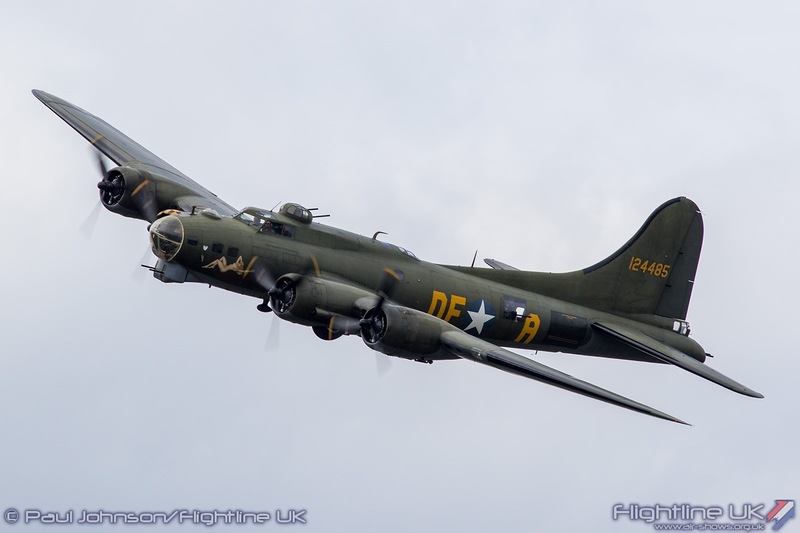 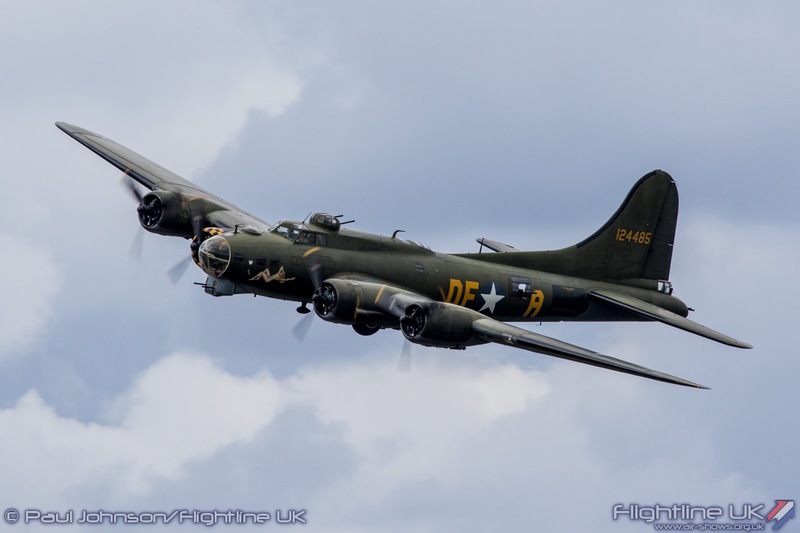 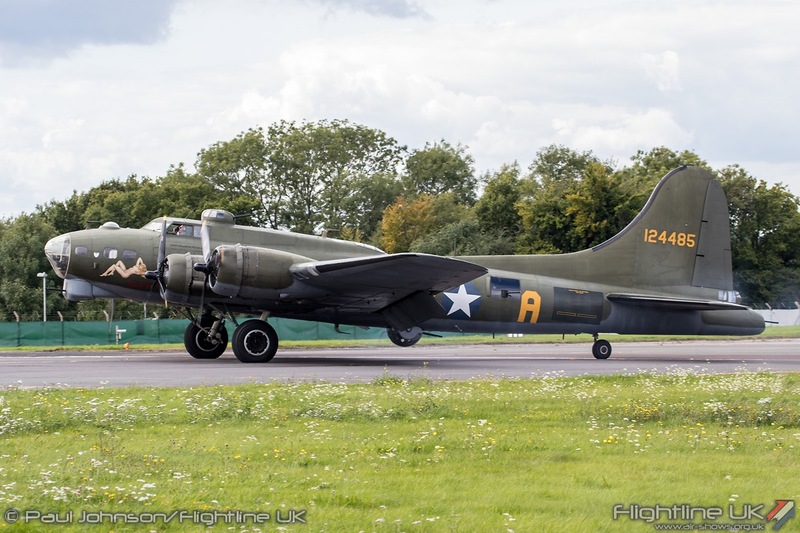 Boeing B-17G Flying Fortress “Sally-B” is very much part of the Biggin Hill story as the airfield was where the aircraft landed first landed in the UK after being bought by the late Ted White. 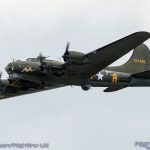 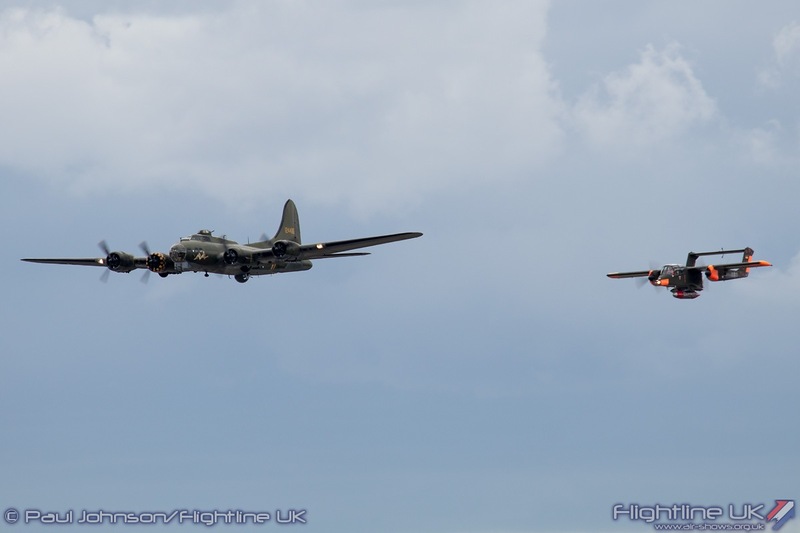 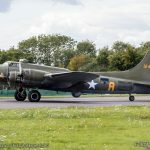 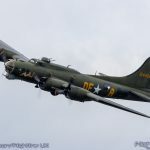 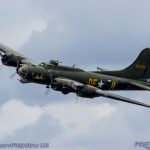 Despite initially being slated for immediate export to the US, the aircraft has remained in the UK as an aerial memorial to the men of the United States Army Air Force for over 40 years thanks to the sterling efforts of Elly Sallingboe and the Sally-B supporters. 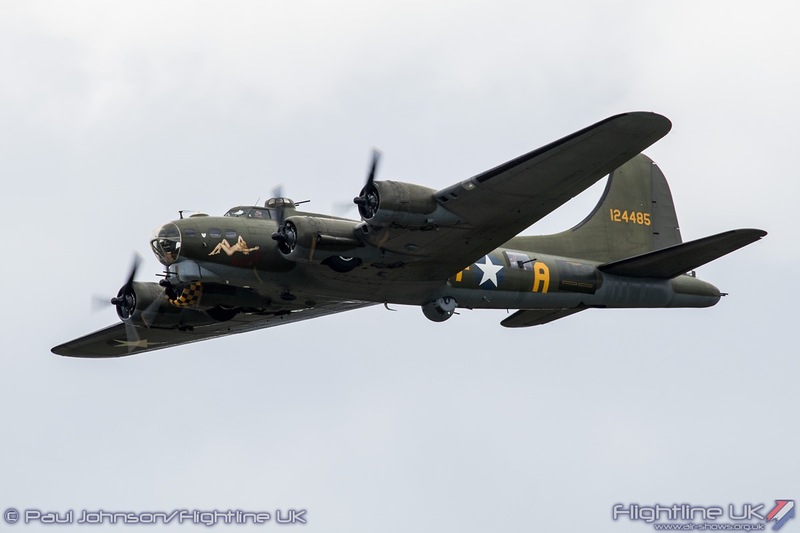 Throughout that time, “Sally-B” has attended almost every airshow at Biggin often flying in the company of other historic aircraft. 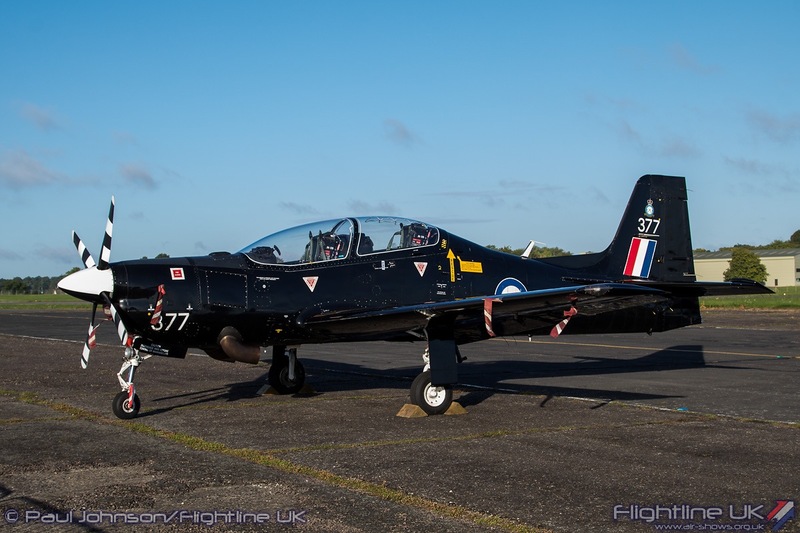 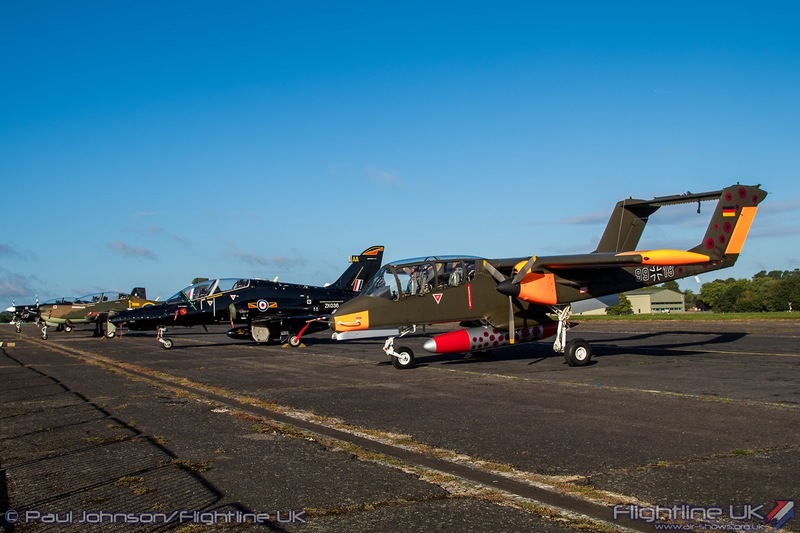 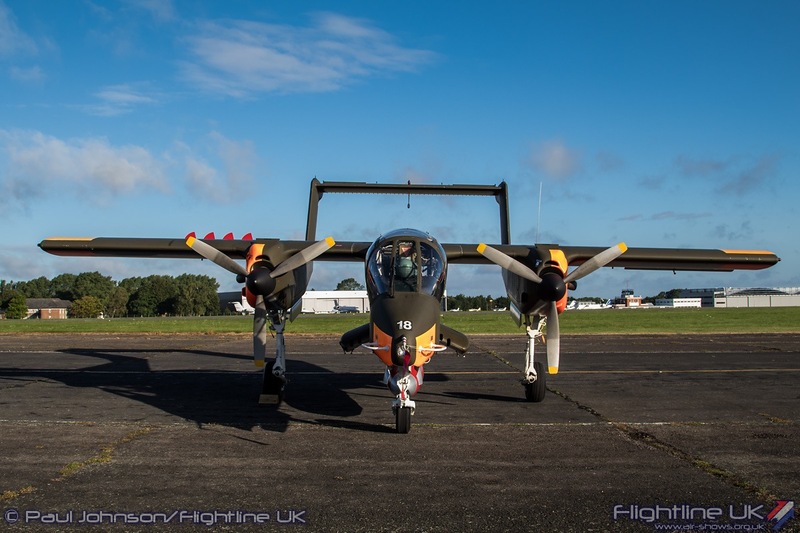 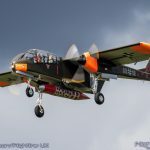 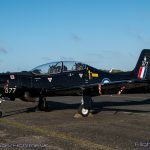 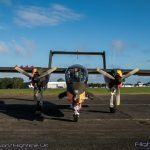 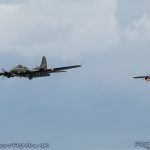 The 2017 Festival of Flight was no different for on the Saturday, she arrived in company with the North American OV-10B Bronco flown by Tony de Bruyn for a very special one-off flypast of American air power from two very different eras. 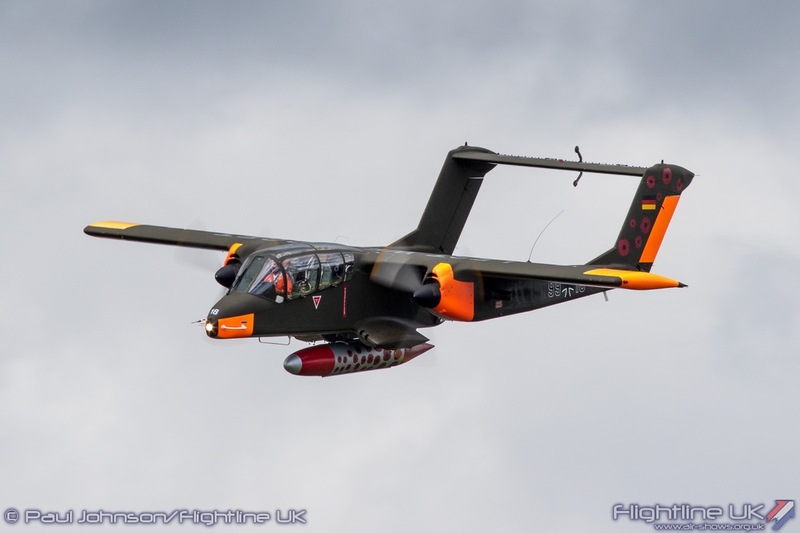 The Bronco Demo Team are relative newcomers to Biggin Hill, but have become very popular participants. 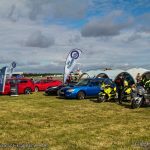 The team’s enthusiasm and Tony’s eye-catching displays always capture the crowd’s imagination and their stall was very busy throughout the show weekend. 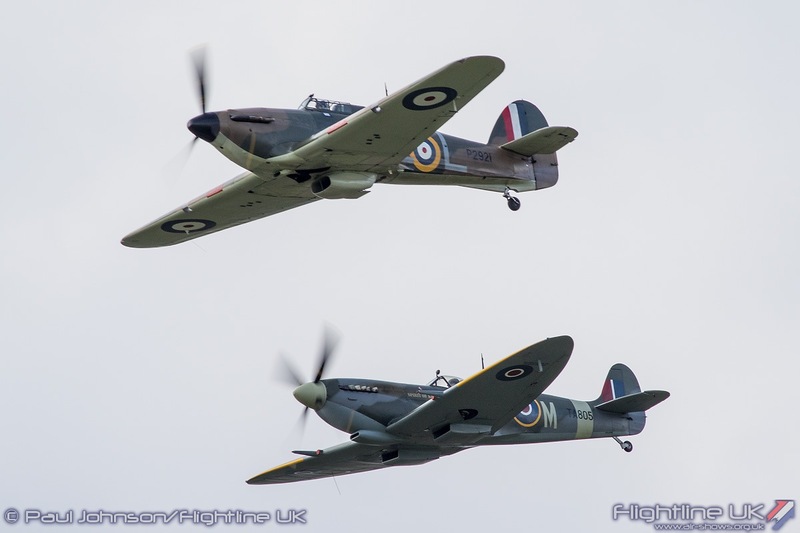 It was a difficult week for the RAF’s Battle of Britain Memorial Flight. 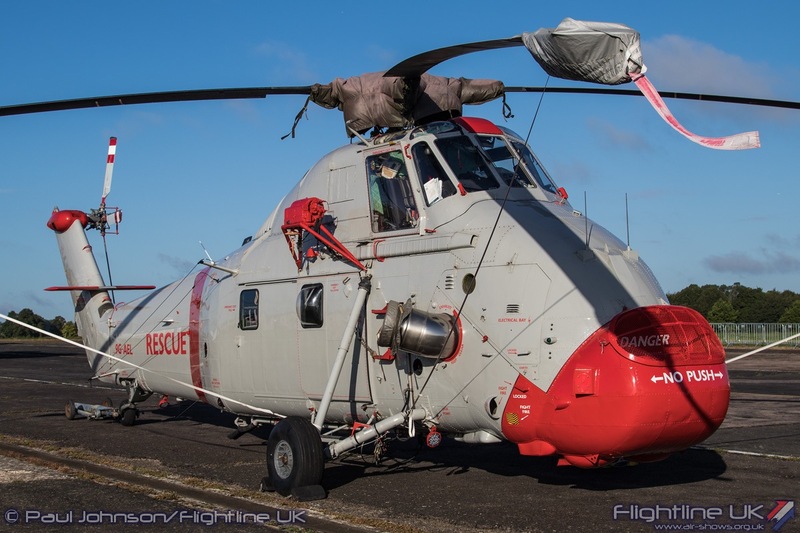 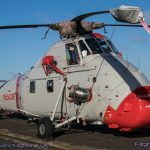 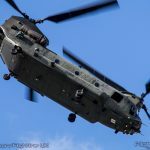 The flight had to suspend all operations with its Merlin-powered fleet after issues were found with one of their Hurricane’s engine. 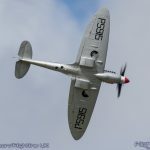 They did however send Supermarine Spitfire PRXIX PS915 for solo display to open each days flying. 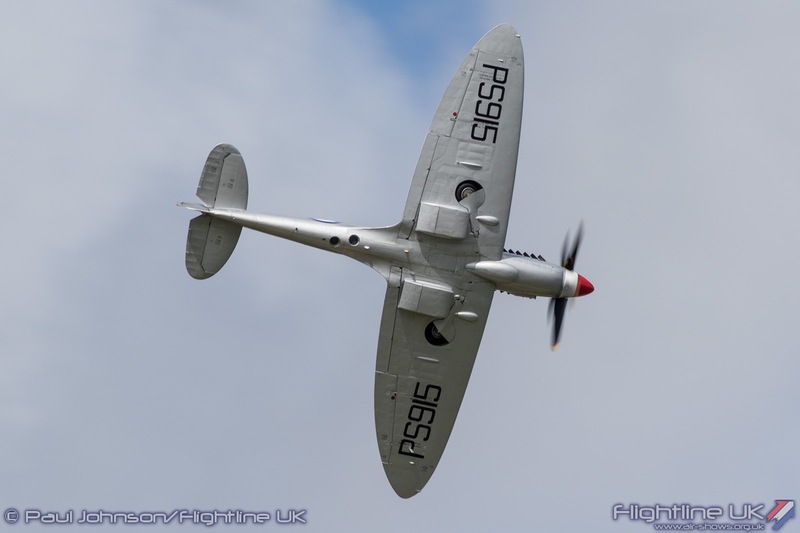 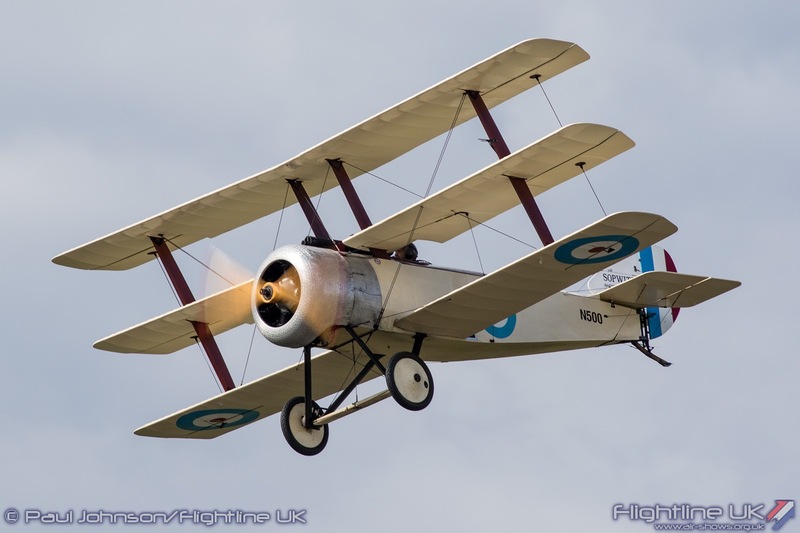 PS915 is another significant aircraft in Biggin’s 100 years as it was one of the founding aircraft of the then RAF Historic Aircraft Flight which forming at the Kent airfield 60 years ago. 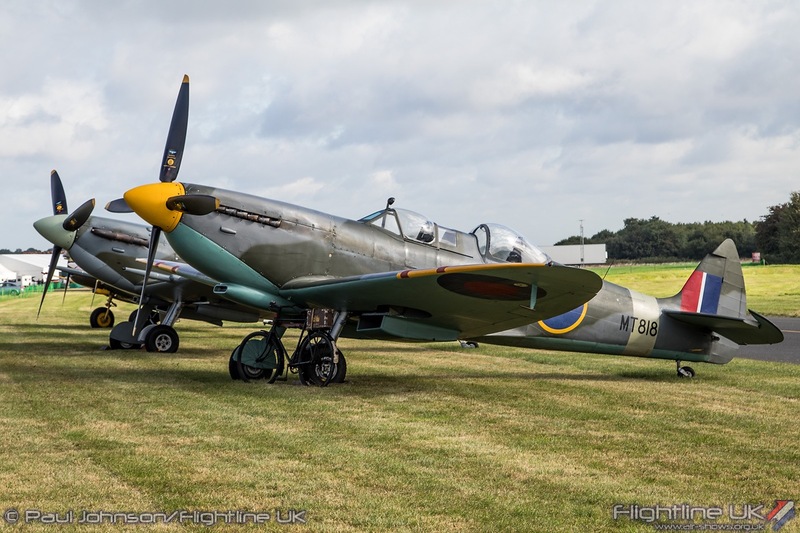 Recent years have seen Biggin Hill become home to a number of historic aircraft and warbirds. 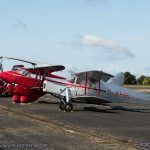 The Shipping and Airlines Collection is based at the airfield and had their beautiful de Havilland DH87b Hornet Moth and DH90 Dragonfly on display in the static park. 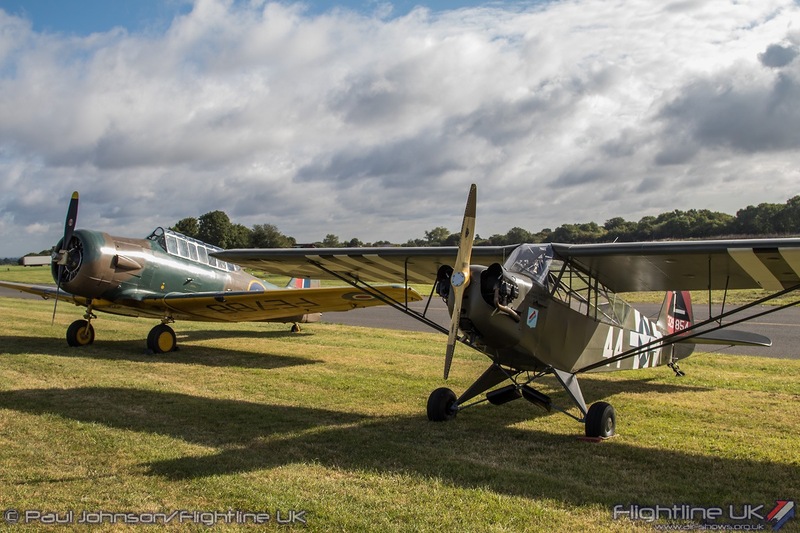 But by far the most prolific historic aircraft operator at the airfield is the Biggin Hill Heritage Hangar. 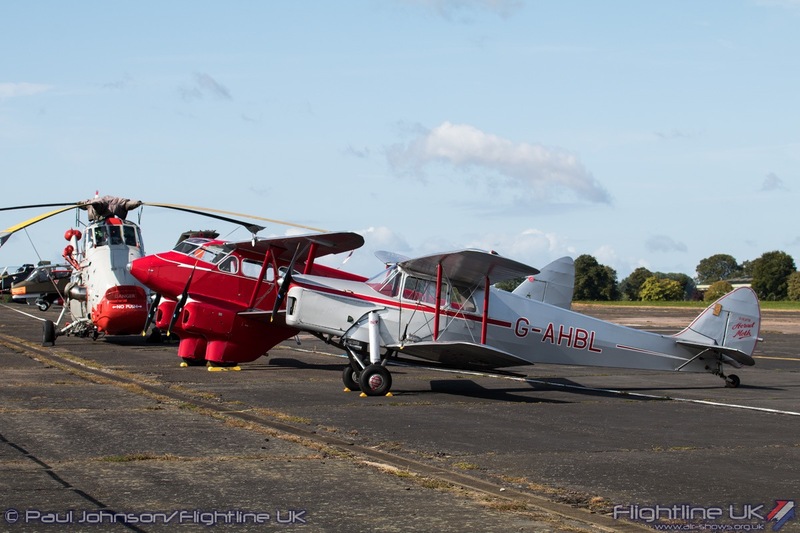 BHHH has grown into a sizable organisation restoring and operating a number of different historic types. 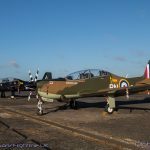 Sadly their Bf109E was not ready for the event, but they did display their rare Supermarine Spitfire T.Mk.VIII on the ground alongside Spitfire Vb EE602, Spitfire XVI RW382, the Piper L4 Grasshopper and North American AT-6 Harvard. 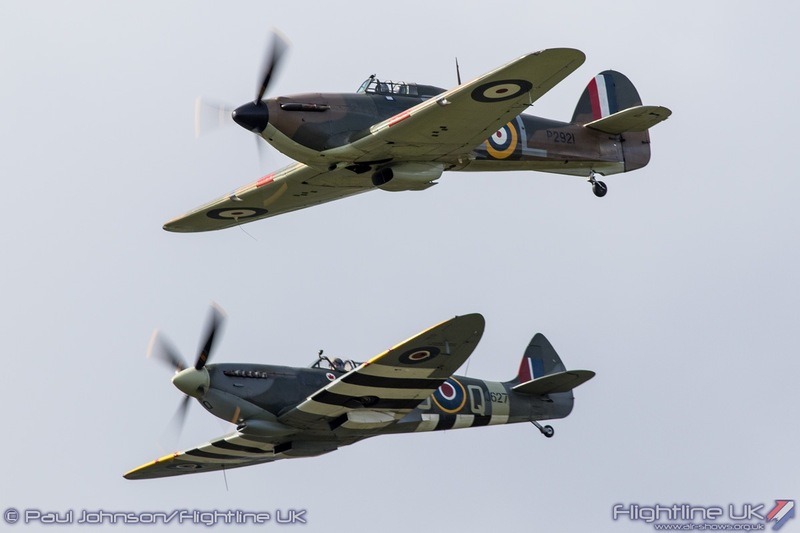 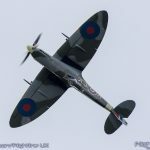 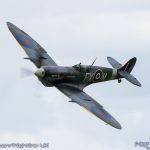 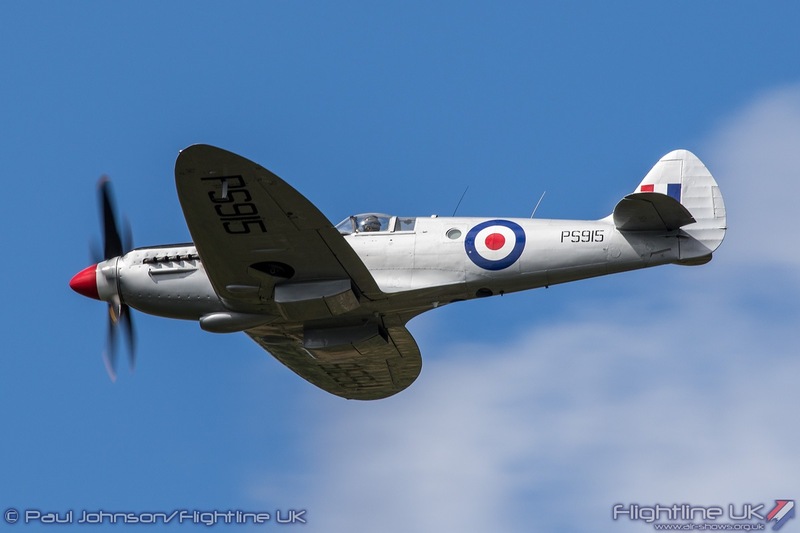 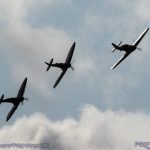 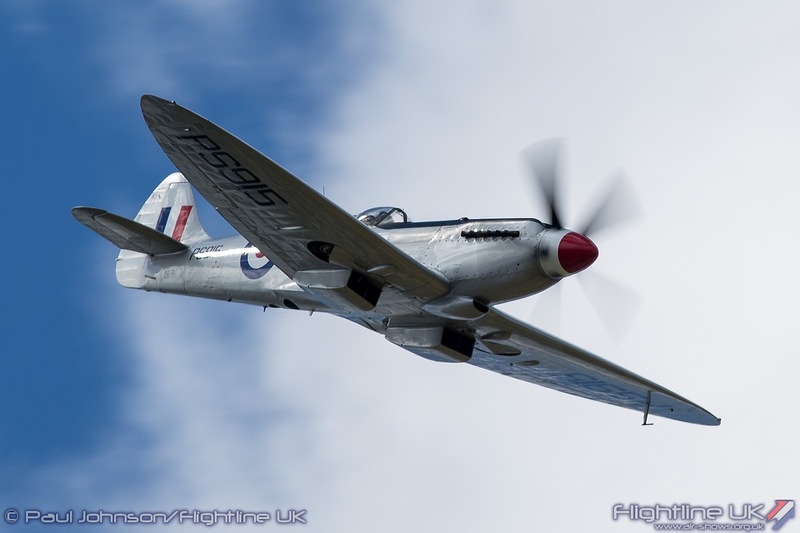 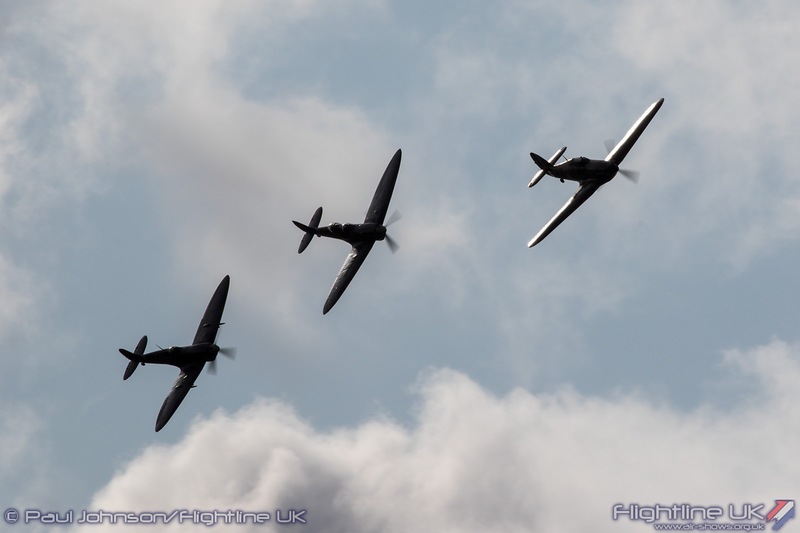 BHHH also provide the finale to both days flying with a trio of Hawker Hurricane X AE997, Supermarine Spitfire IXT MJ627 and Spitfire IX TA805. 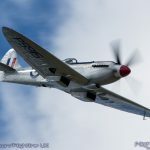 After some gentle formation flying and tailchase, Dan Griffith closed the show in Spitfire IX TA805 “The Kent Spitfire.” Dan’s solos in the Spitfire really do show off the aircraft as a fighter with a fast opening pass leading in to some very tight half-cubans and steep turns. 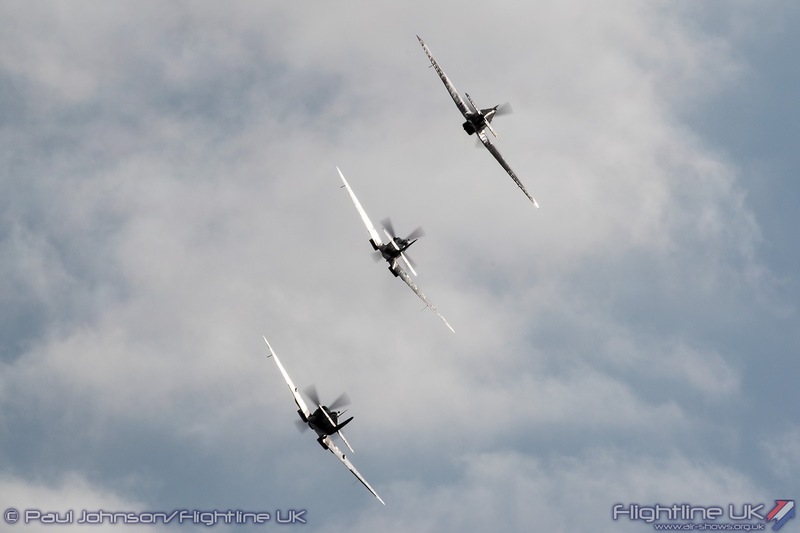 It was a stylish end to each days flying that echoed some of the great Spitfire finales of previous events. 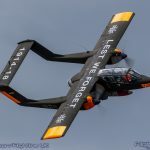 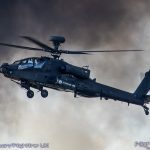 The stand out feature of this year’s Festival of Flight was the level of modern military participation. 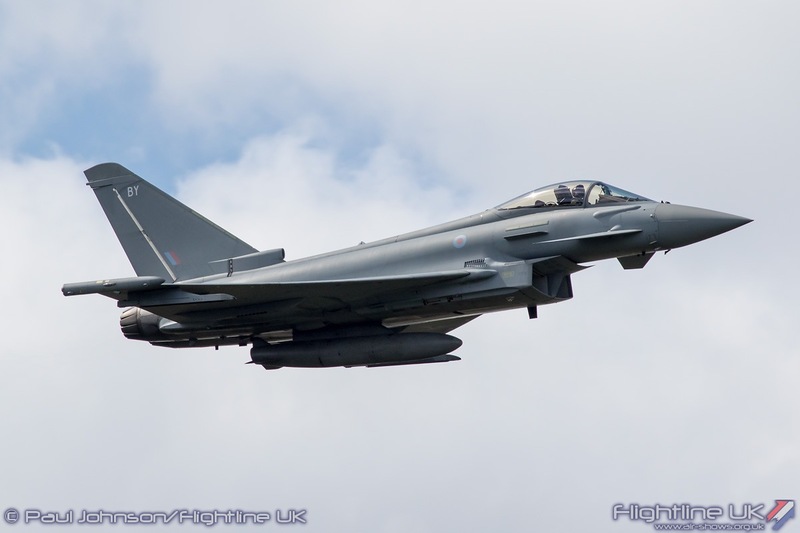 Despite a couple of cancellations, the Royal Air Force had a particularly strong showing. 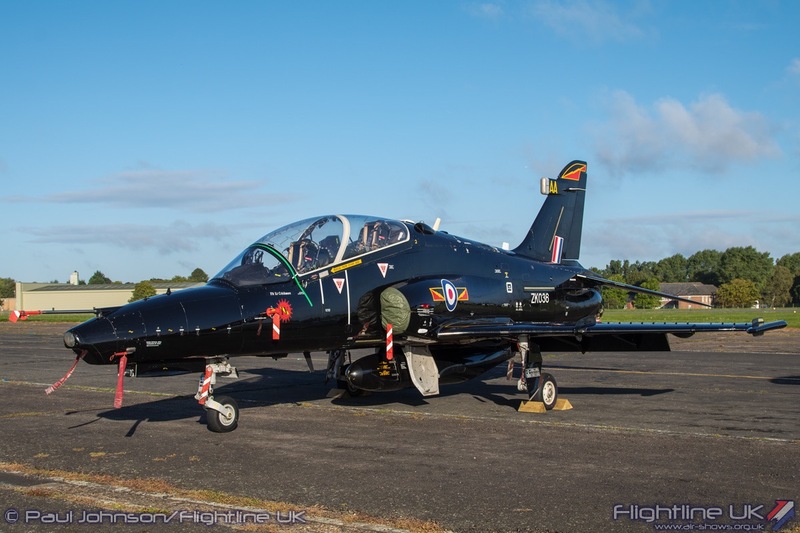 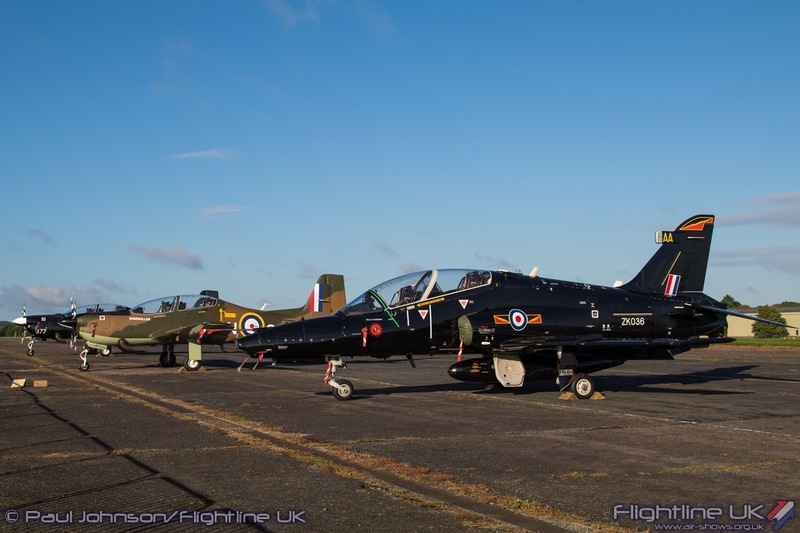 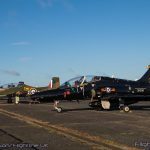 RAF training was well represented on the ground with a pair of Shorts Tucano T1s and a BAE Systems Hawk T2 on static display. 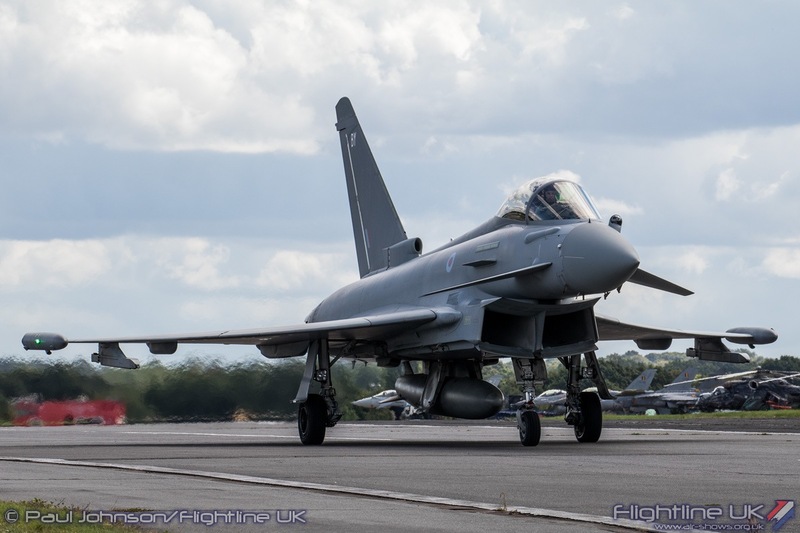 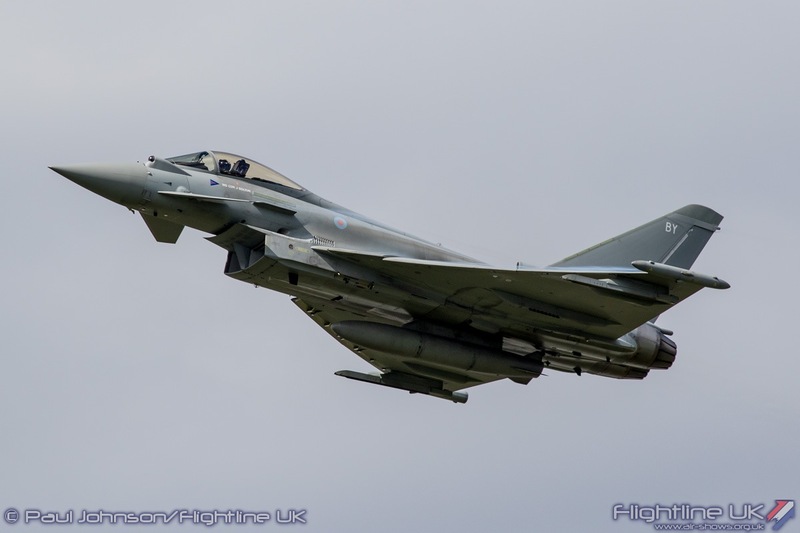 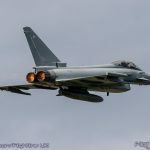 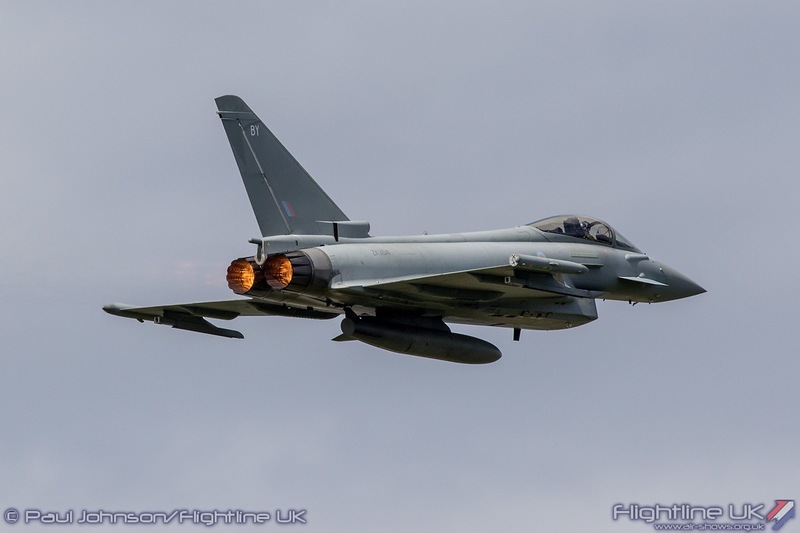 It was a busy weekend for the Eurofighter Typhoon FGR4 Display Team with commitments at Eastbourne and Herne Bay as well as at Biggin. 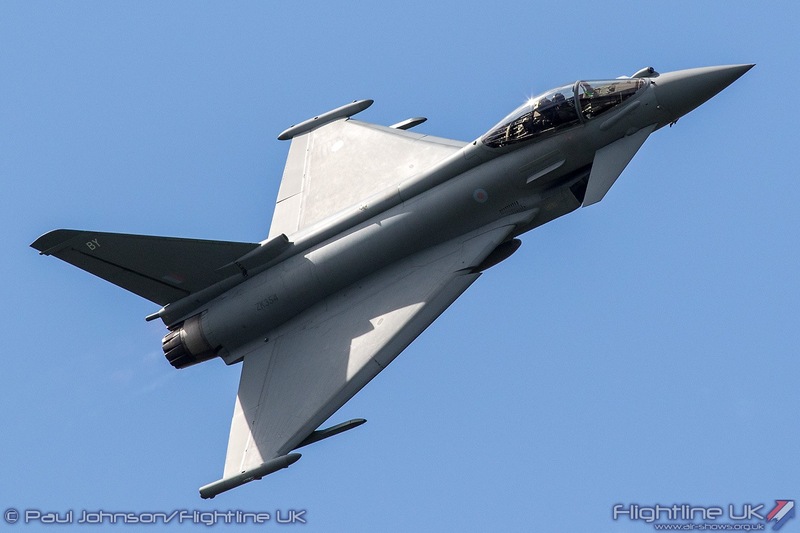 Though based at Biggin, the team could only display on the Sunday but Saturday’s audience did see the aircraft twice as it took off and recovered from the other events. 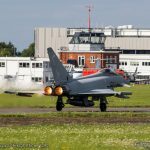 Ryan’s routine on the Sunday was significant as it marked the first full RAF solo jet display at Biggin since the last Air Fair in 2010. 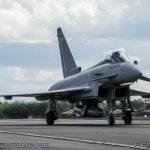 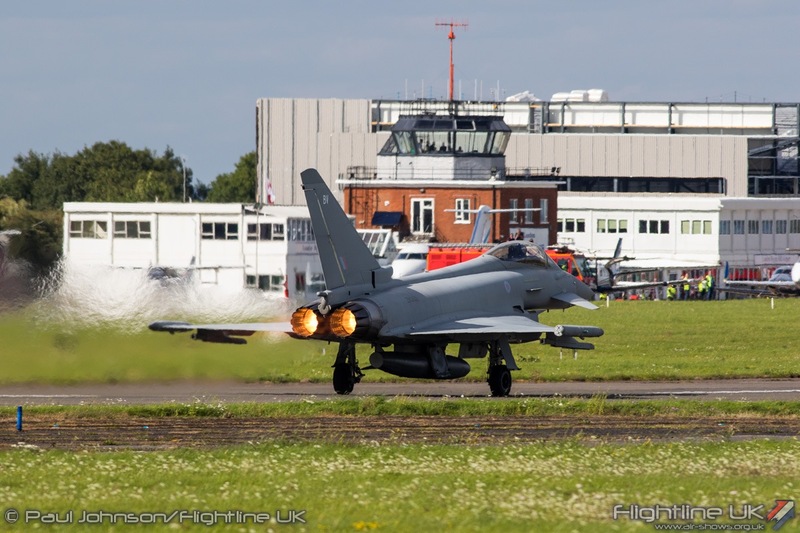 (A Typhoon did appear in 2015 as part of the Synchro75 routine with a BBMF Spitfire.) 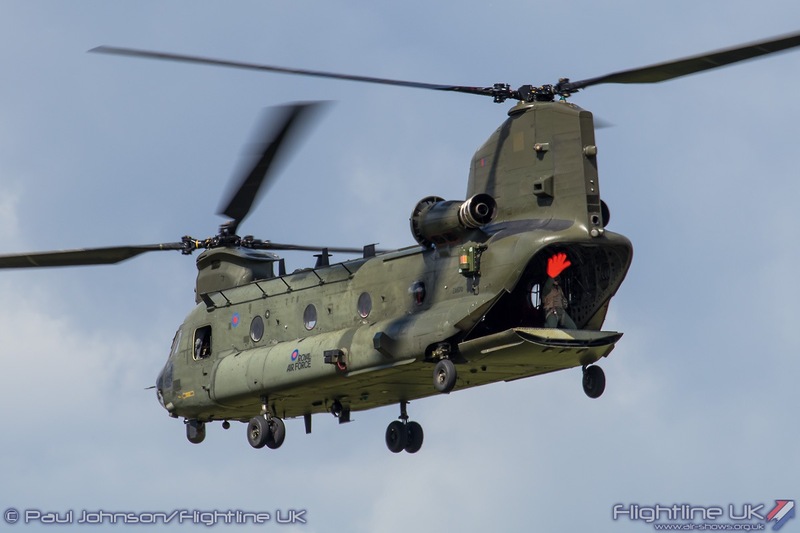 Saturday’s display saw an appearance by the excellent Boeing Chinook HC4 solo display. 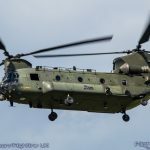 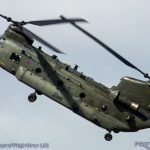 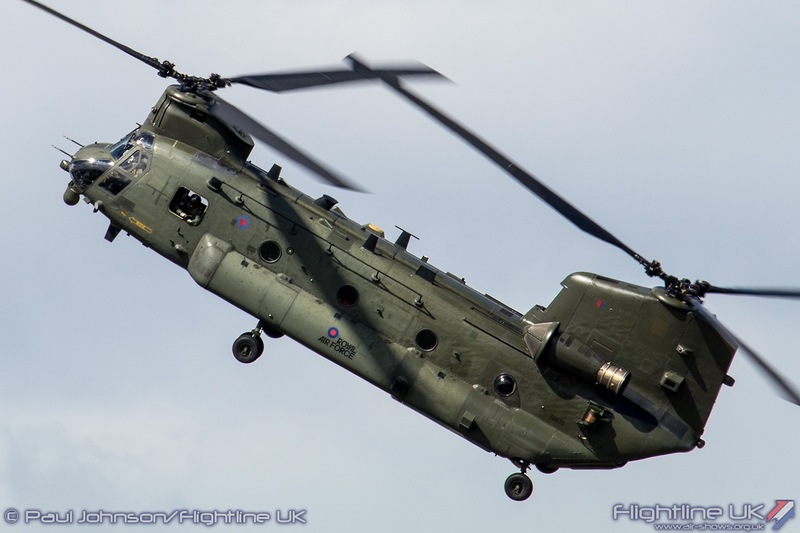 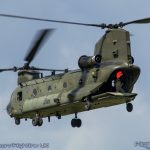 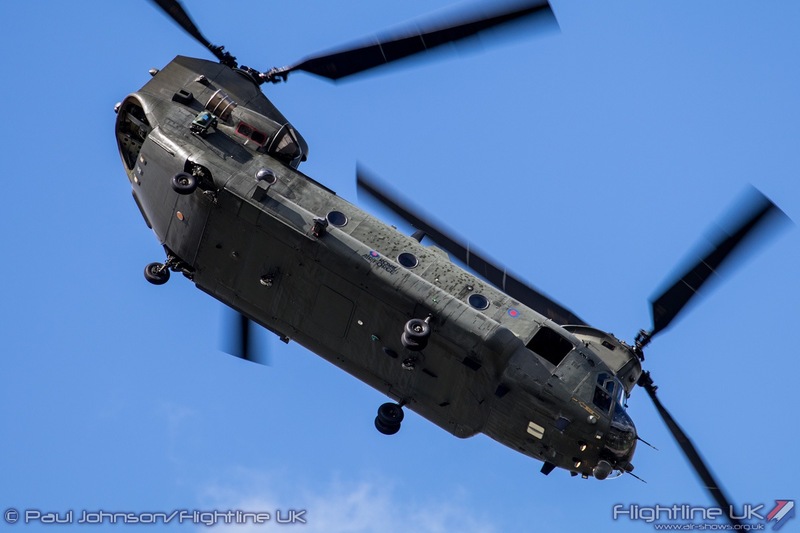 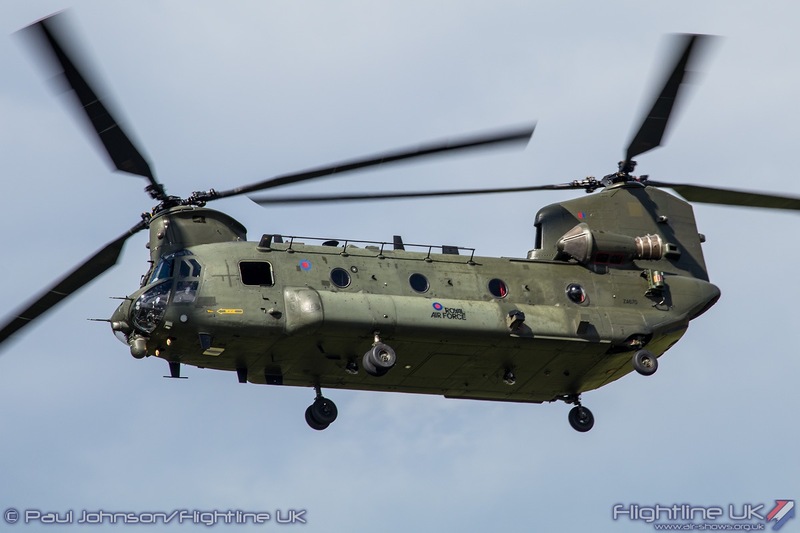 Due to current operations, the Chinook displays are quite limited this year and often are operating out of their home base at RAF Odiham rather than land away. 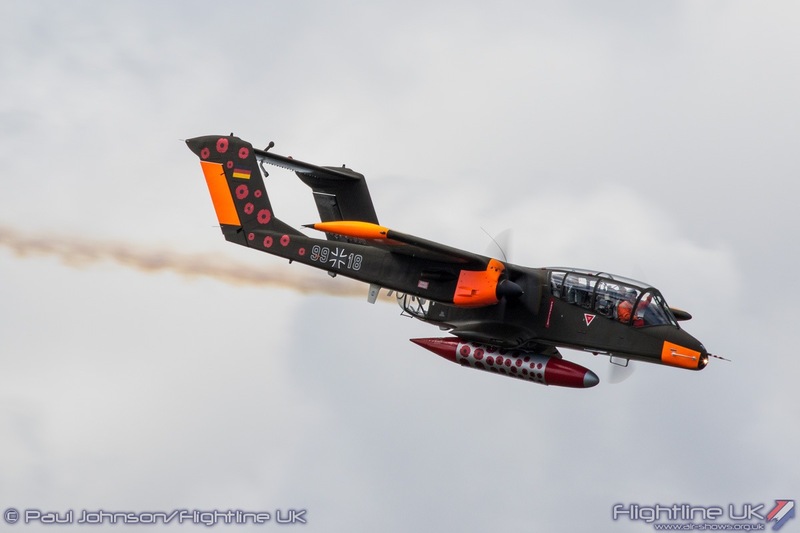 However, it was good to see the aircraft put in an appearance showing off its incredible agility. 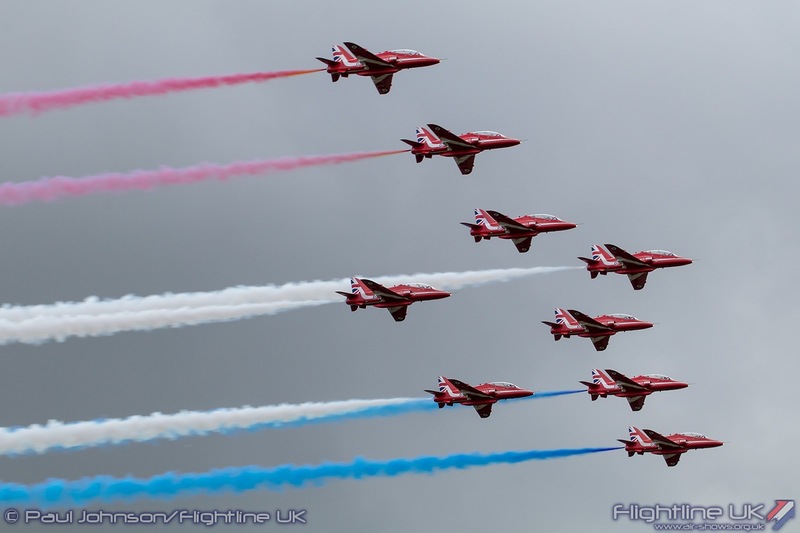 As always, the Red Arrows with their nine scarlet BAE Systems Hawk T1s were a high-point of the weekend. 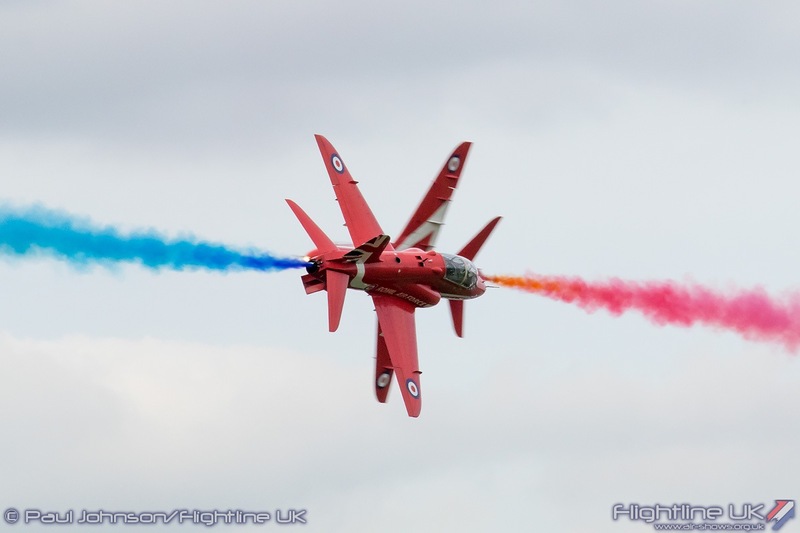 However, it was a particularly significant display for Red 10, Squadron Leader Mike Ling. 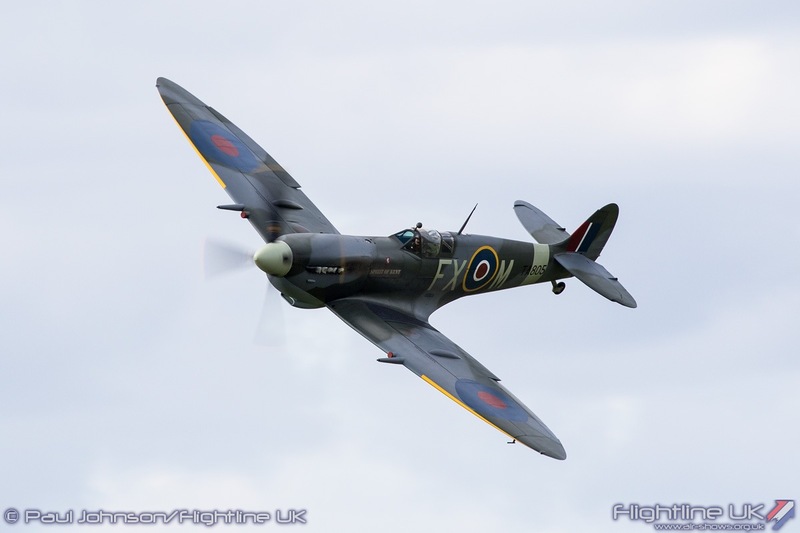 Mike grew up in Biggin Hill and was inspired to join the RAF watching the displays at the Air Fair. 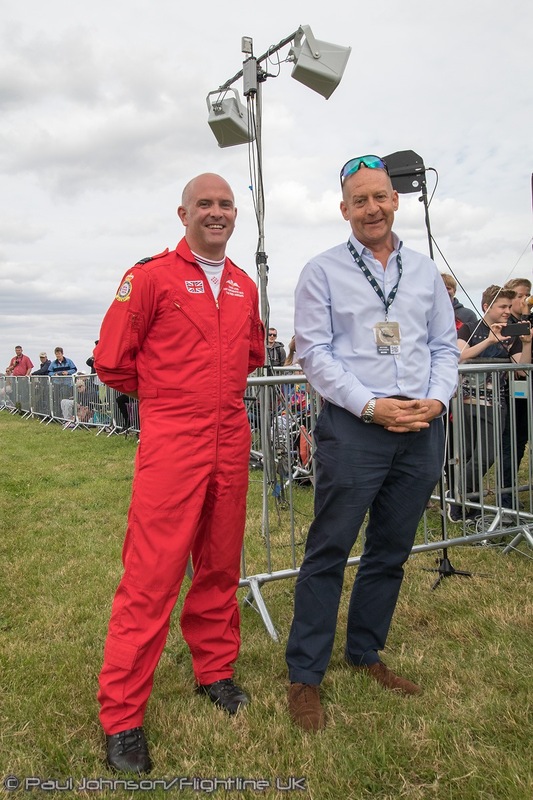 Mike has been a display pilot with the Red Arrows and for the previous five years, the teams’ supervisor and commentator. 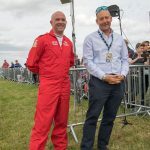 At the end of the 2017 display season, Mike will move on to pastures new so the 2017 Festival of Flight marked the final time he’d fly a Red Arrows jet into and out of his ‘home’ airfield. 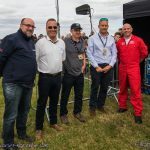 At the end of Sunday’s display, Airport Managing Director Will Curtis paid tribute to Mike along with the rest of the event’s commentary team. 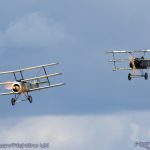 The centenary of the famous Battle of Britain station clearly caught the imagination of European air arms with Belgian, France and the Czech Republic all sending displays. 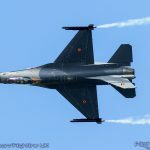 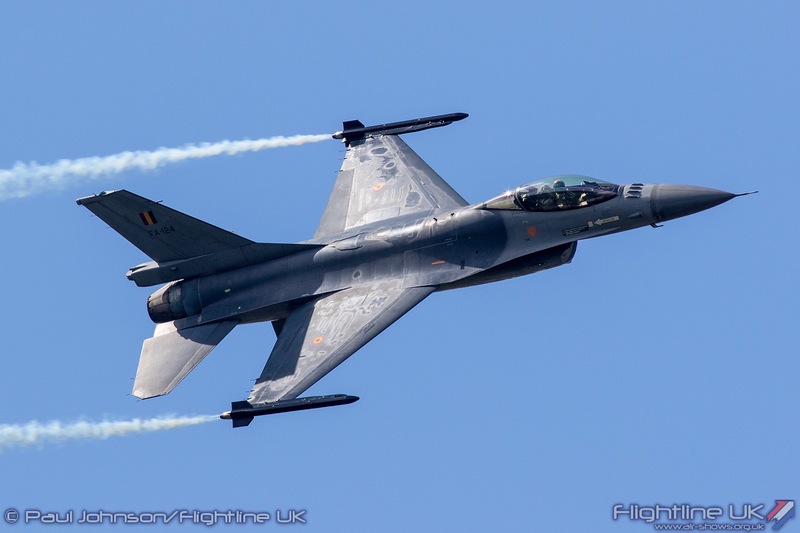 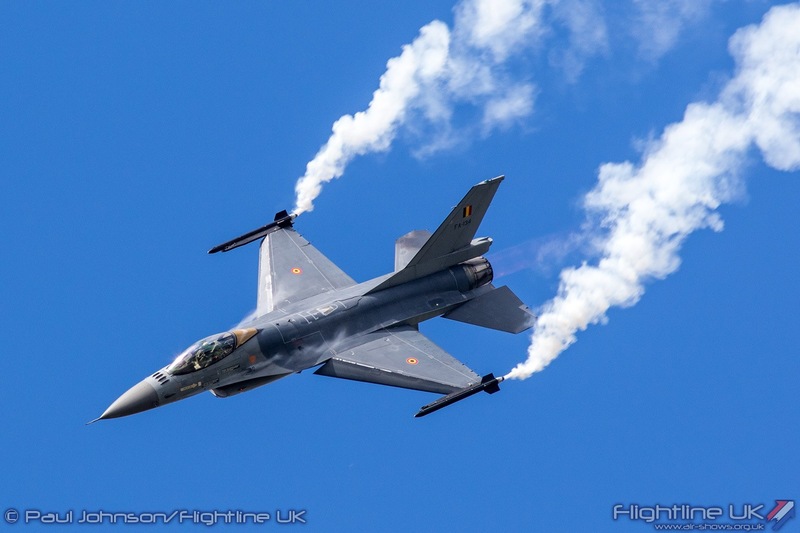 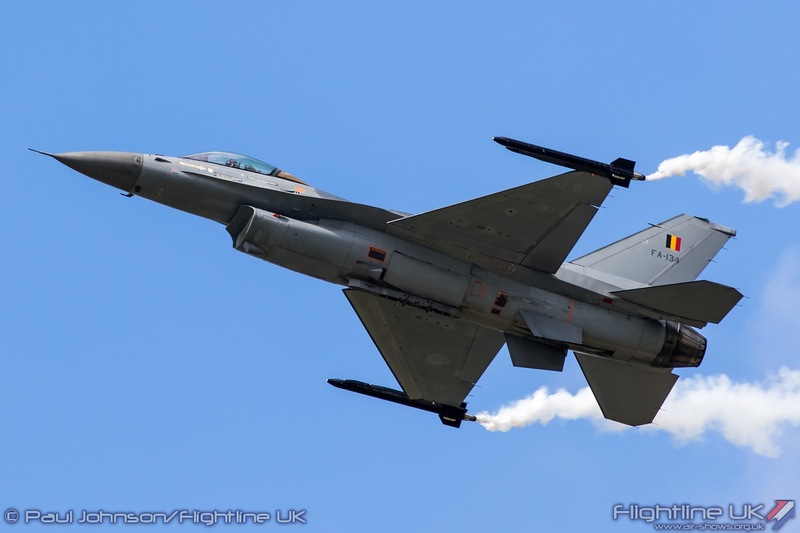 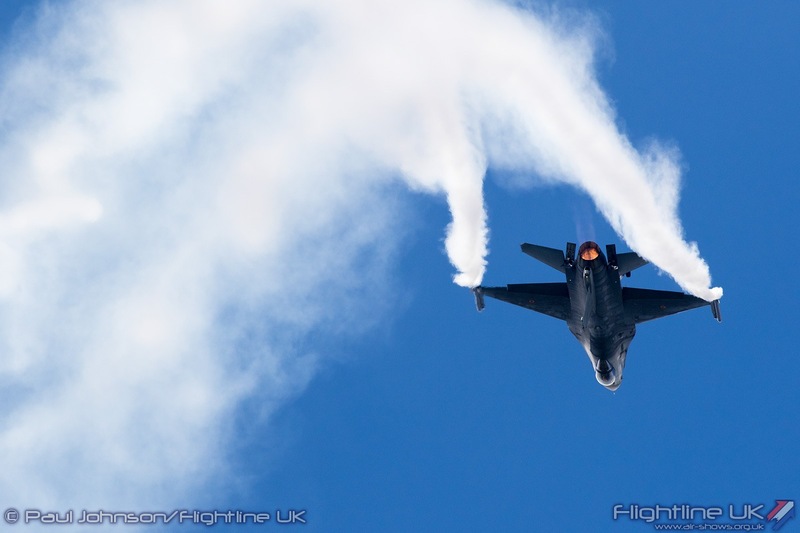 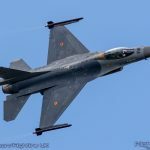 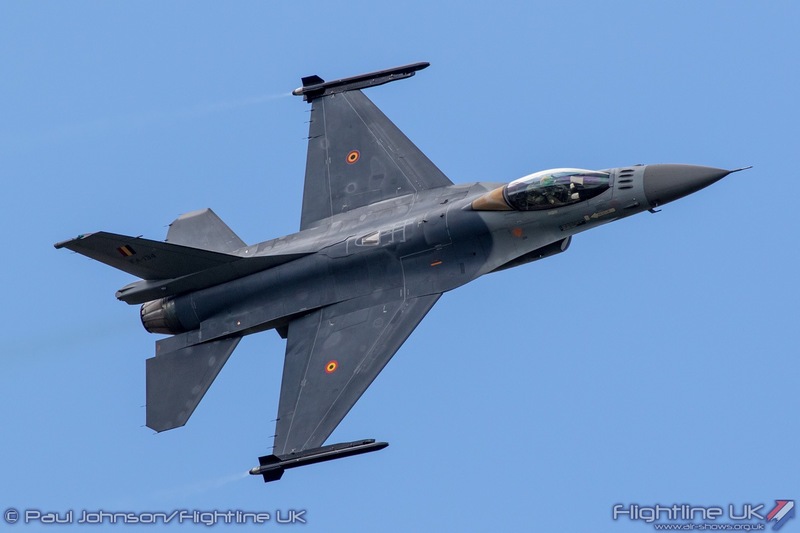 The Belgian Air Force made a welcome return to Biggin Hill with the Lockheed Martin F-16AM Fighting Falcon solo display flown by Cdt Tom ‘Gizmo’ de Moortel. 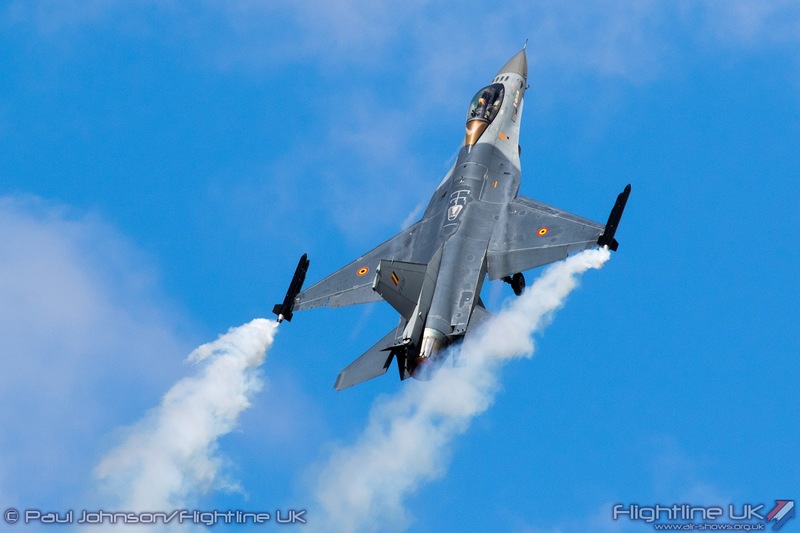 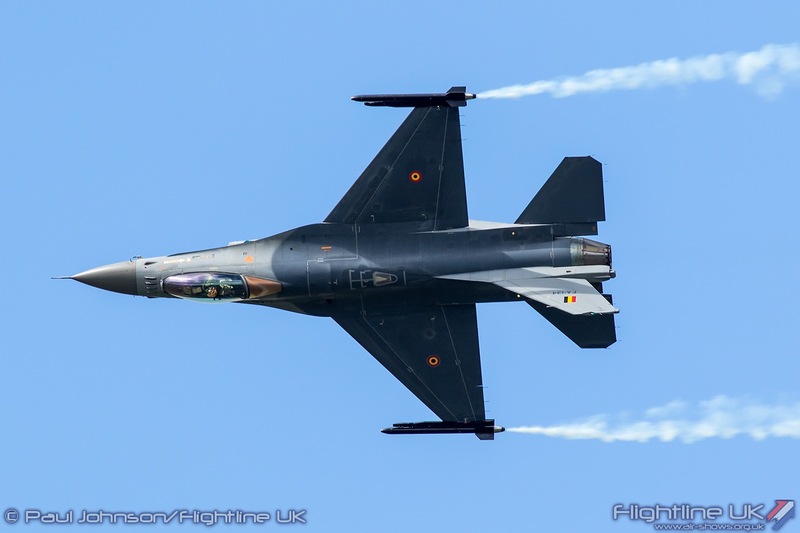 The Belgian Air Force has been a major contributor to airshows at Biggin Hill for many years. 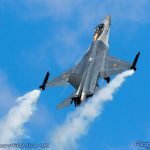 The F-16 was a regular in the 1990s but there have been memorable appearances by the Swallows with their SIAI-Marchetti SF260s and the Slivers with the F-104 Starfighter. 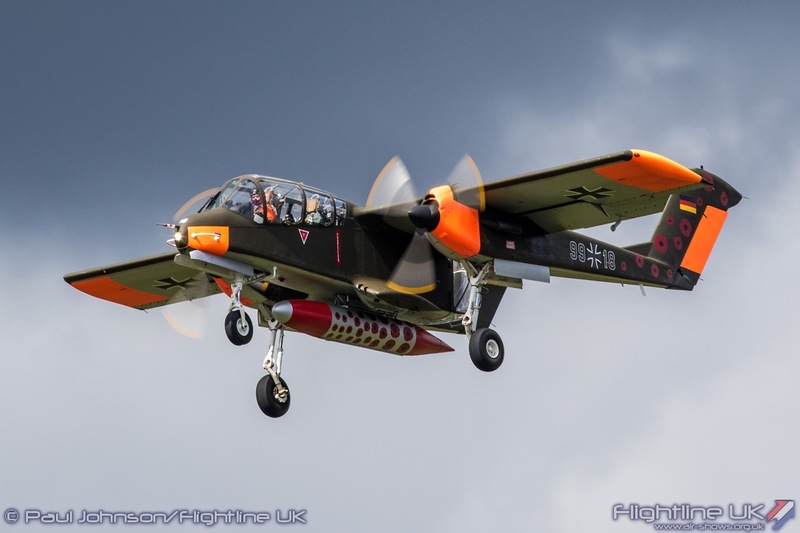 ‘Gizmo’ put on a really tight and noisy display with the relatively restricted airspace over Biggin Hill. 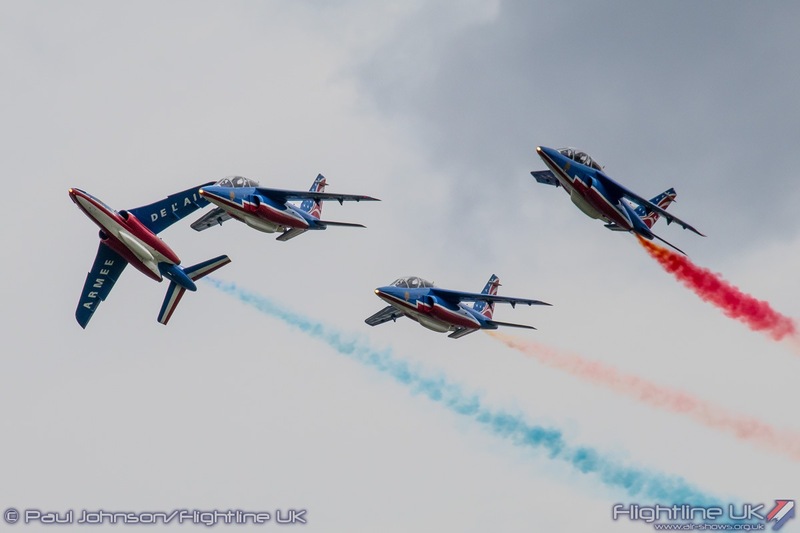 A major coup for the Festival of Flight was the participation of the French Air Force’s national display team, La Patrouille de France. 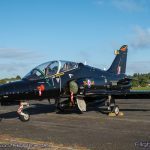 The team flying eight Dassault Alpha Jet Es last flew into Biggin Hill in 1996 for the Battle of Britain Open Day that September. 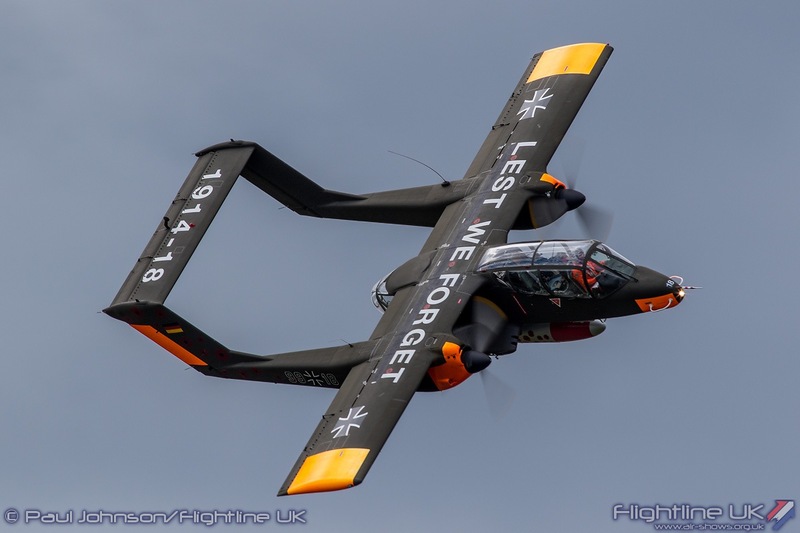 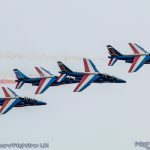 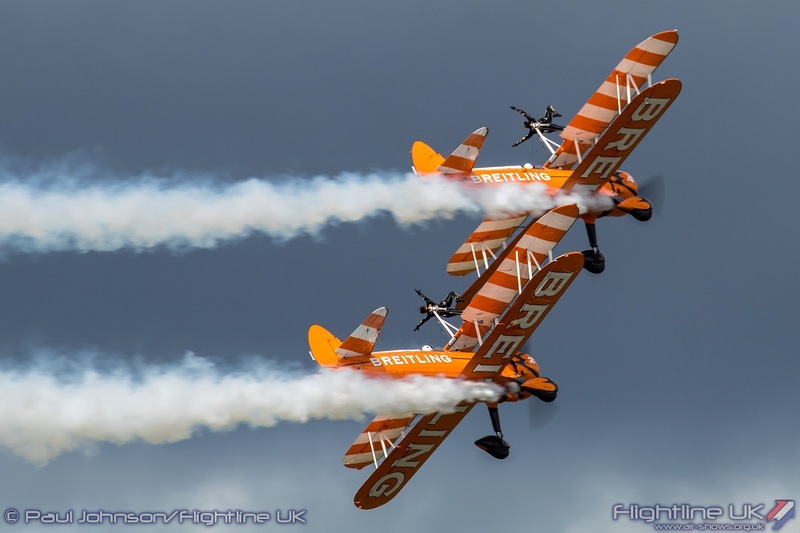 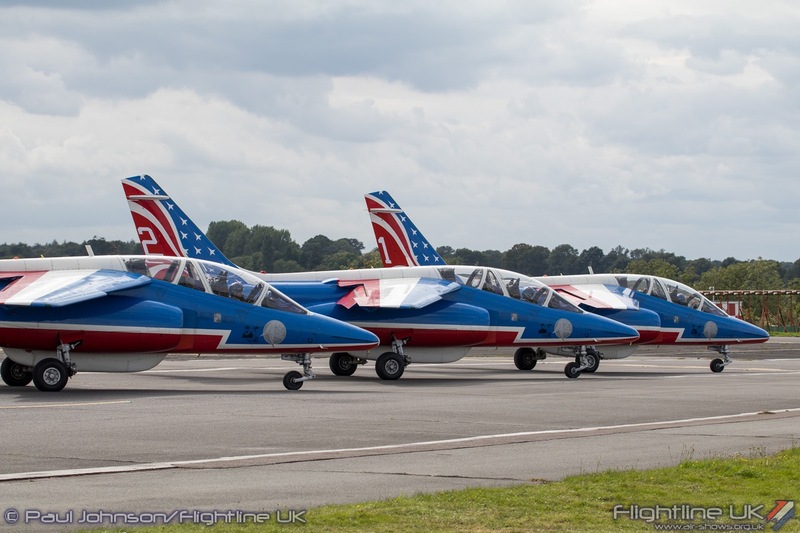 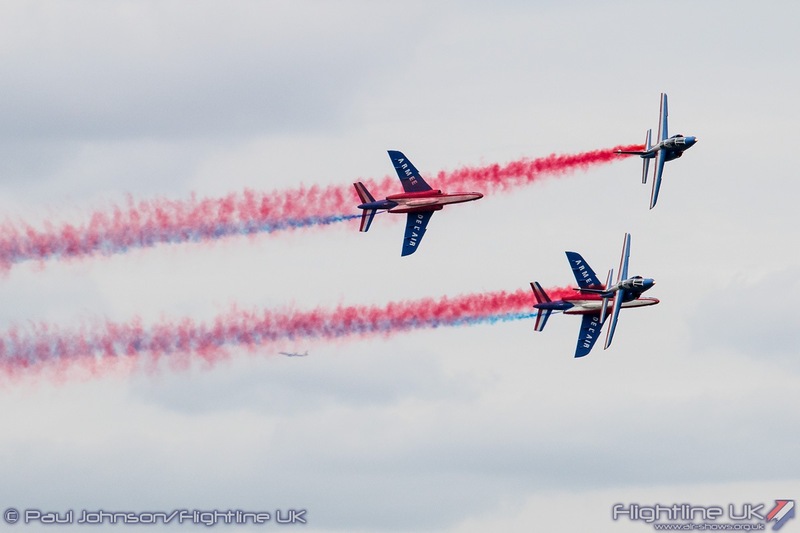 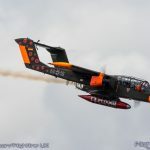 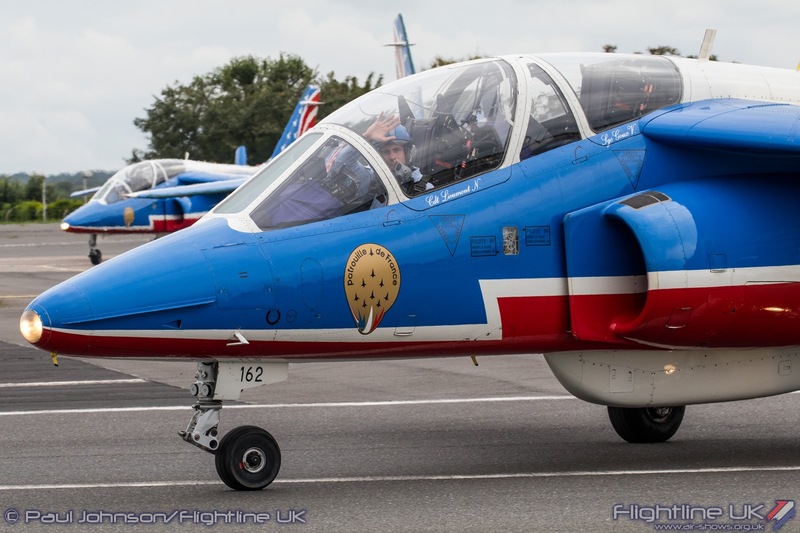 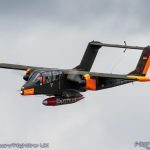 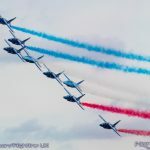 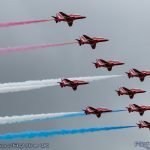 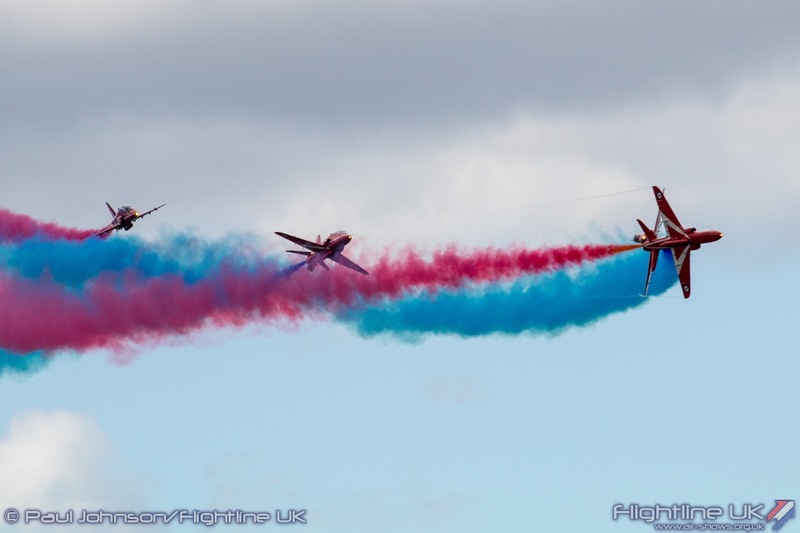 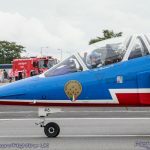 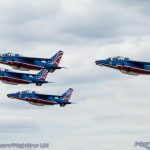 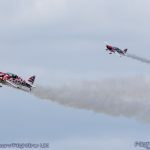 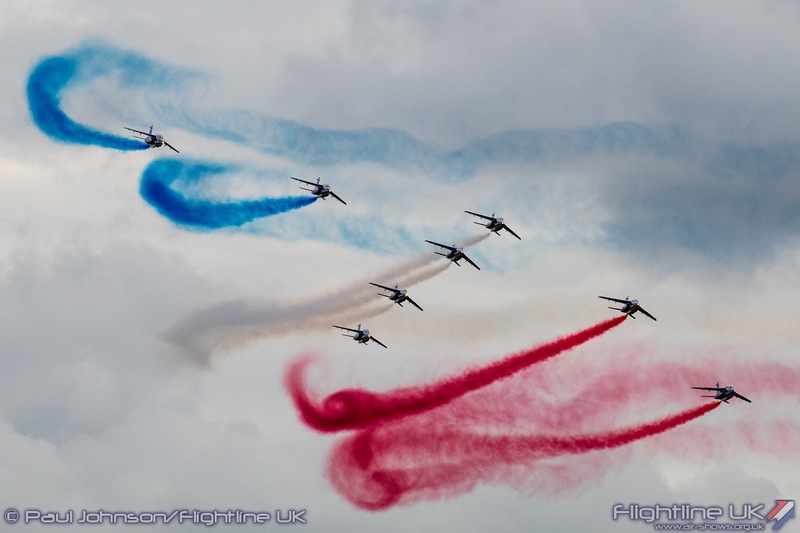 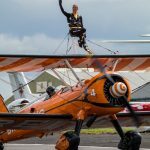 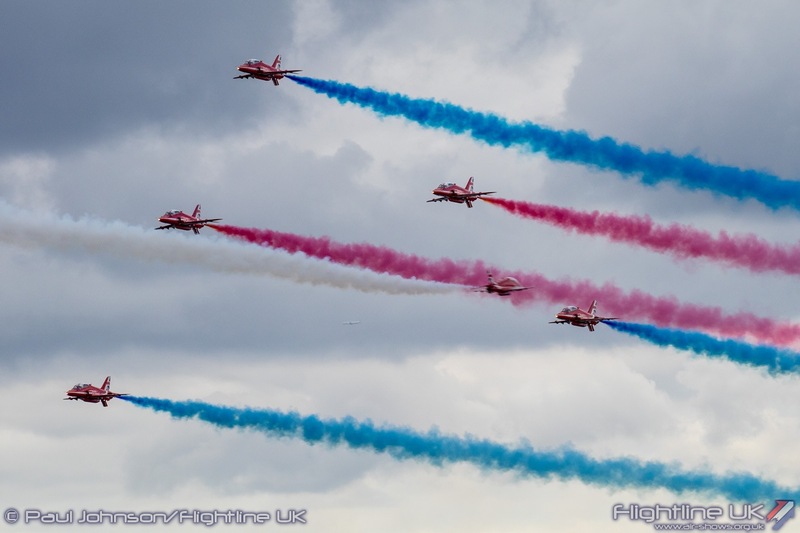 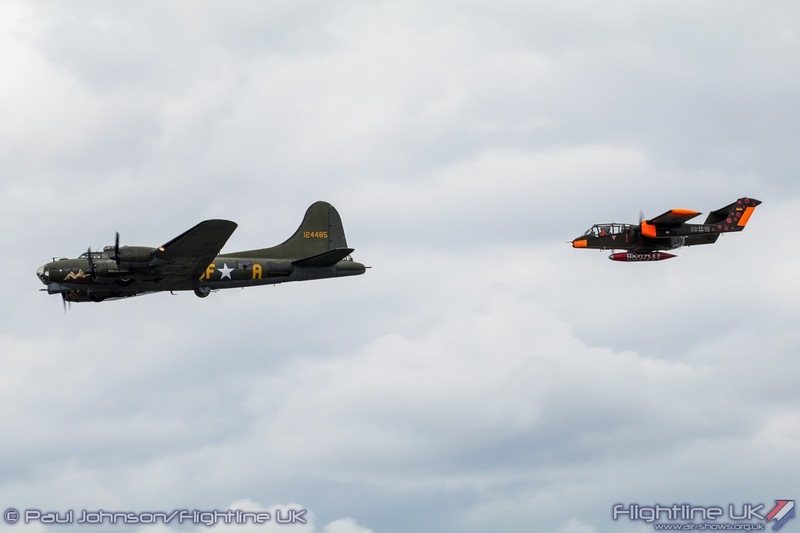 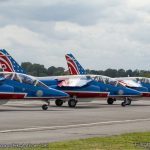 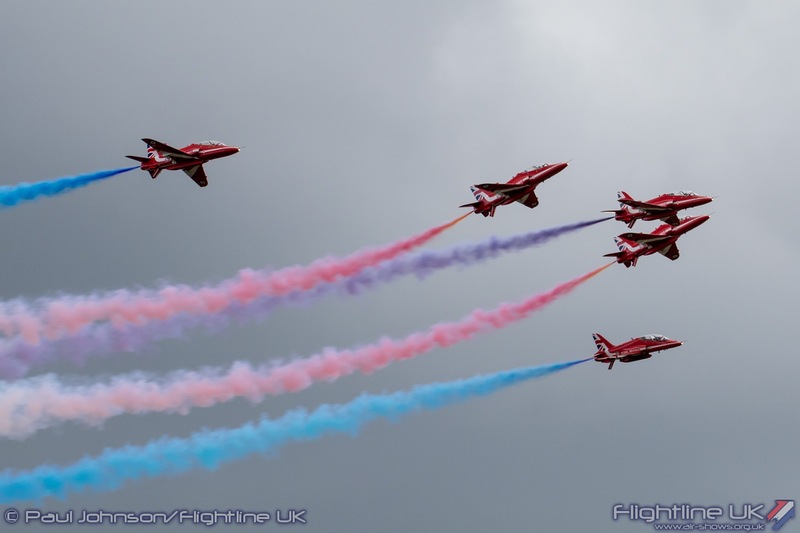 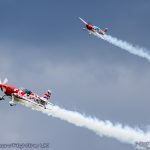 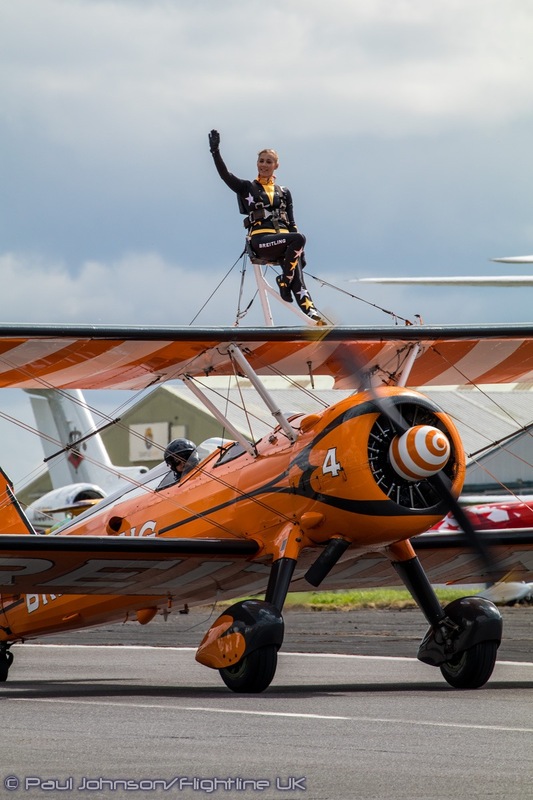 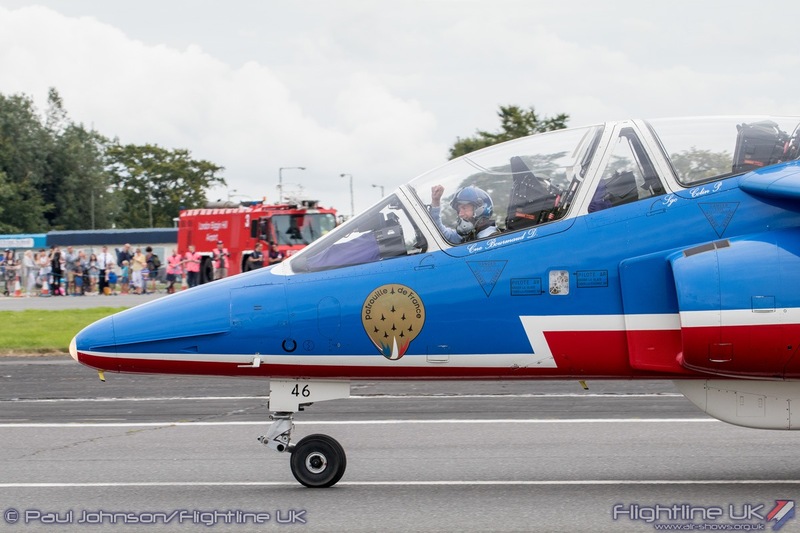 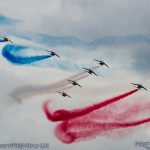 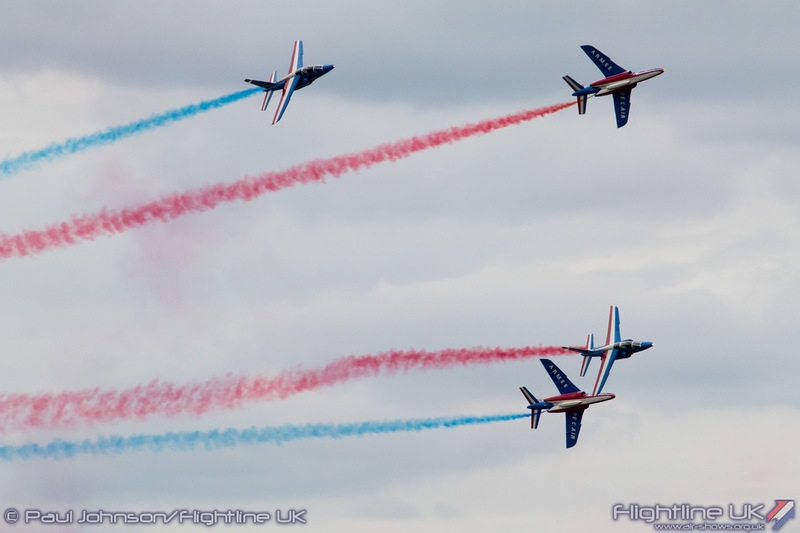 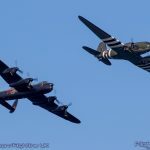 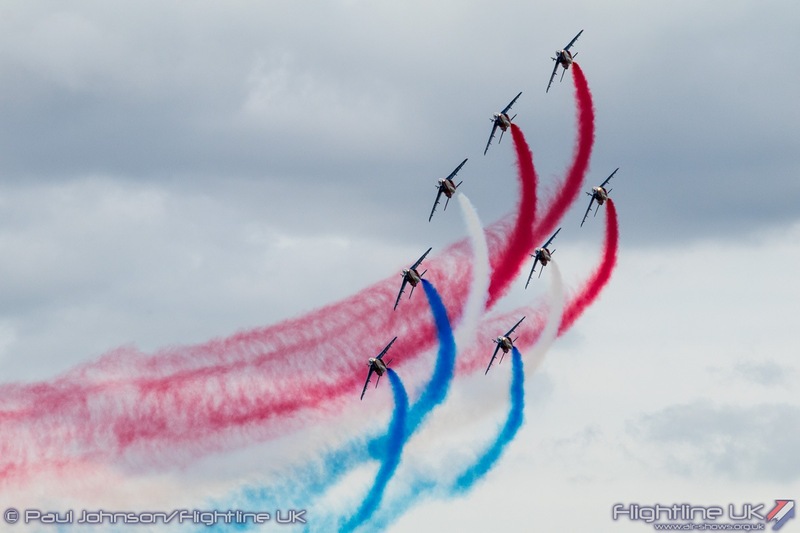 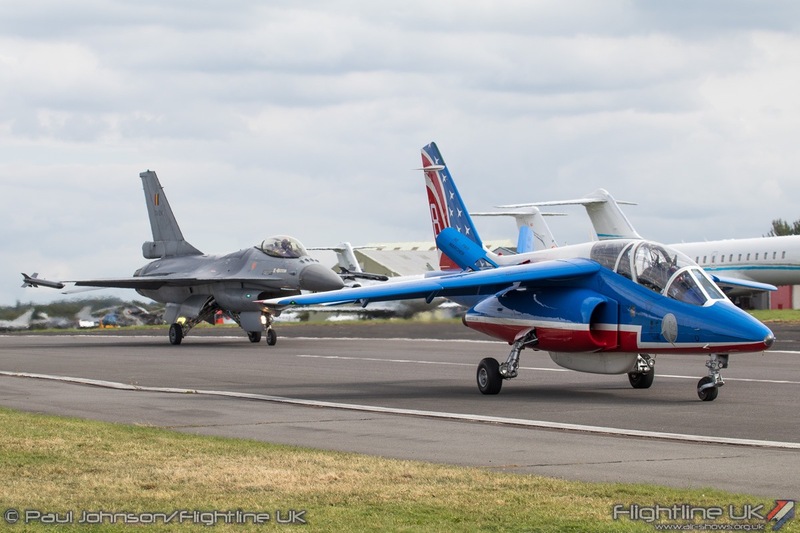 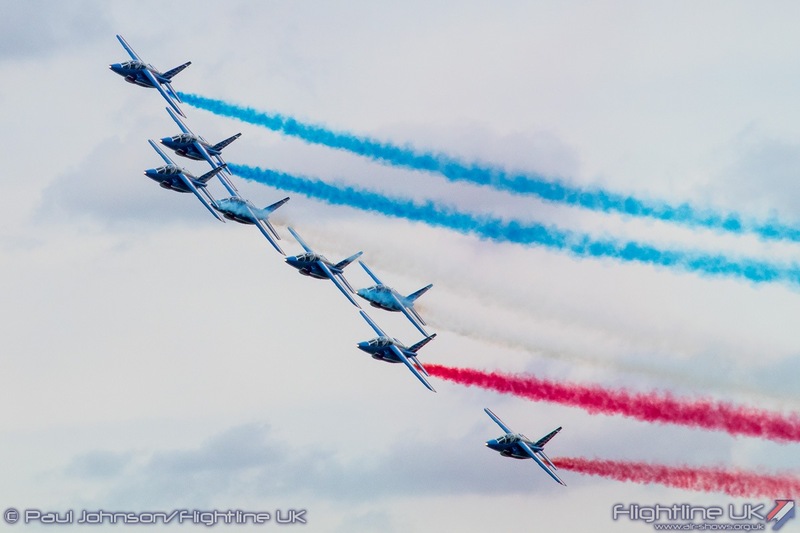 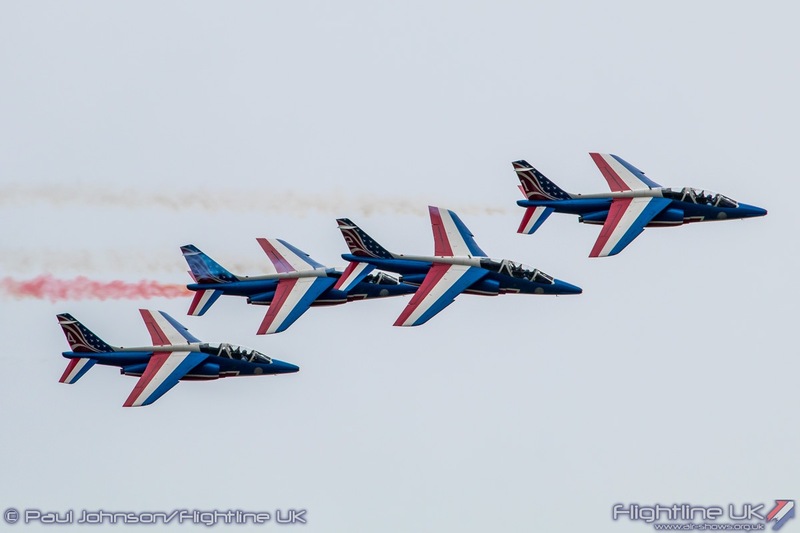 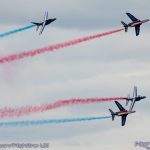 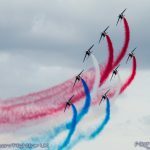 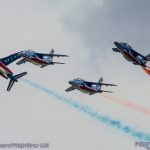 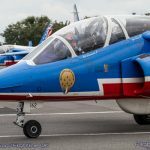 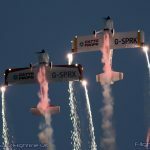 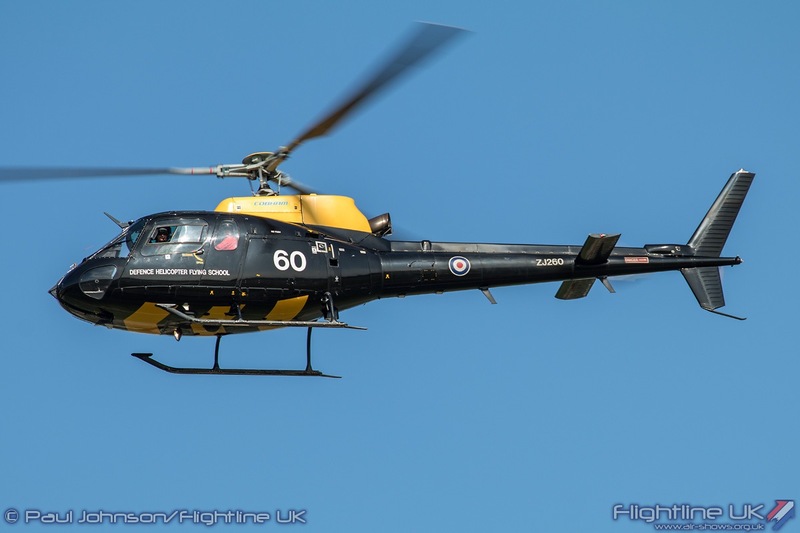 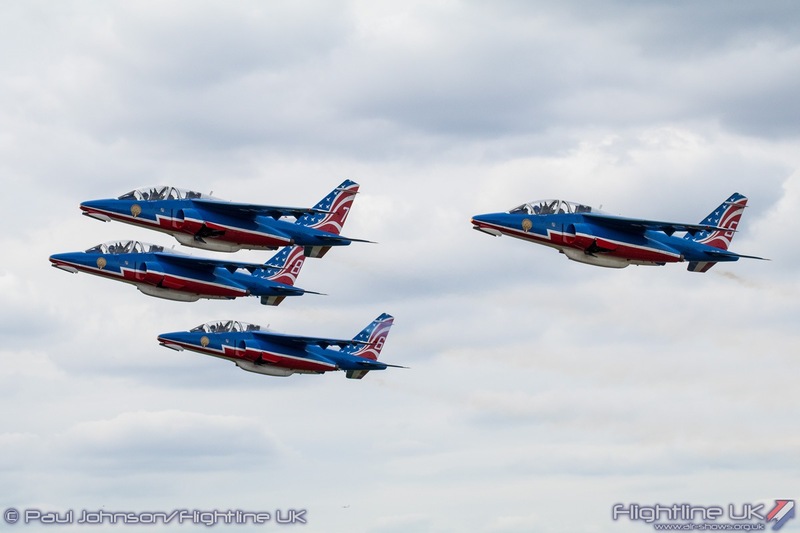 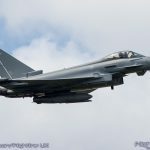 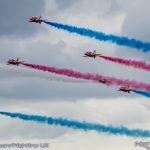 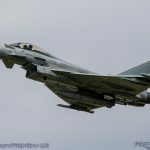 Their Festival of Flight appearance marked the team’s only display in the UK this year and despite being restricted to a flat display by the controlled airspace above, the team put on a typically slick display full of Gallic flair. 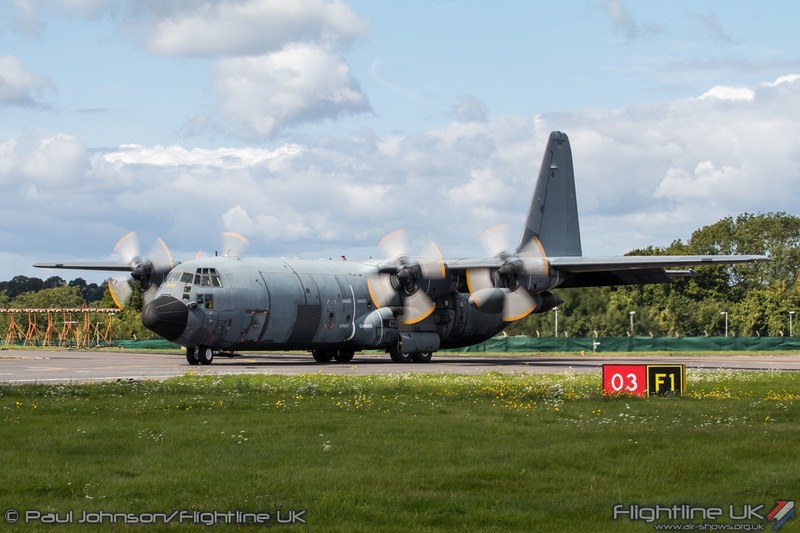 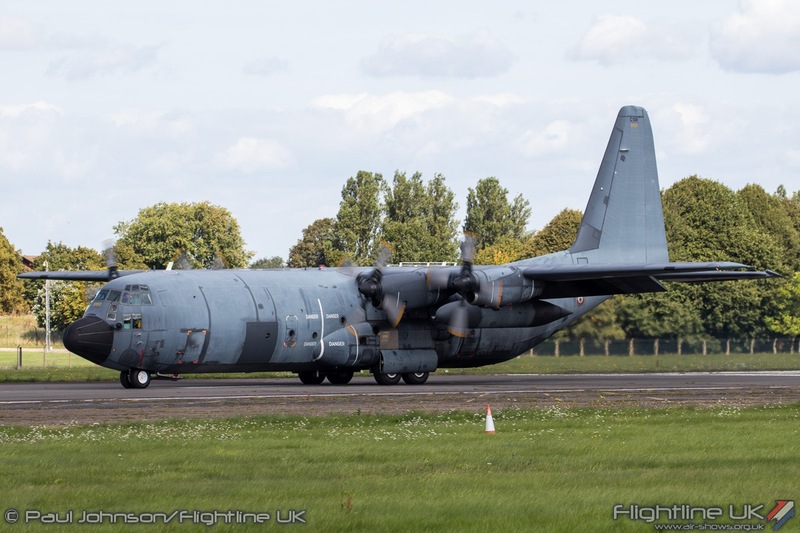 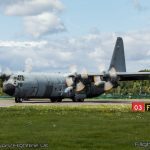 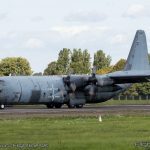 A surprise highlight for enthusiasts attending on the Sunday was a very rare UK appearance of a French Air Force Lockheed C-130H Hercules which was supporting the team. 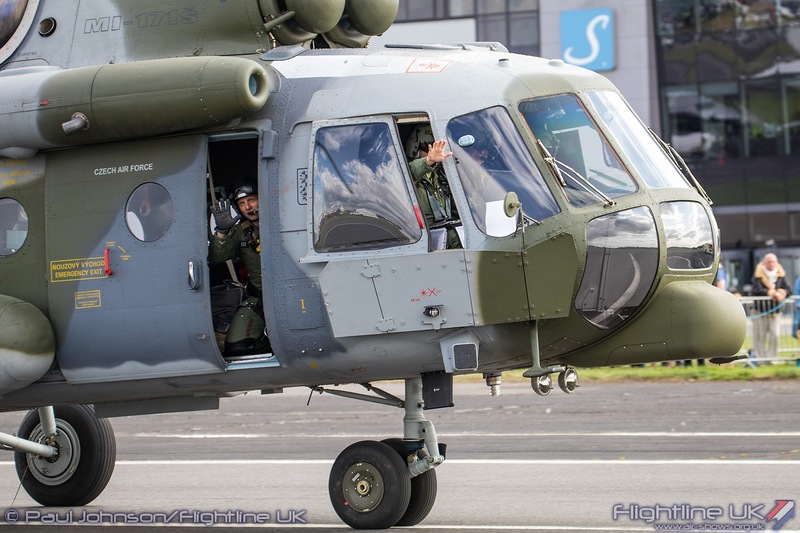 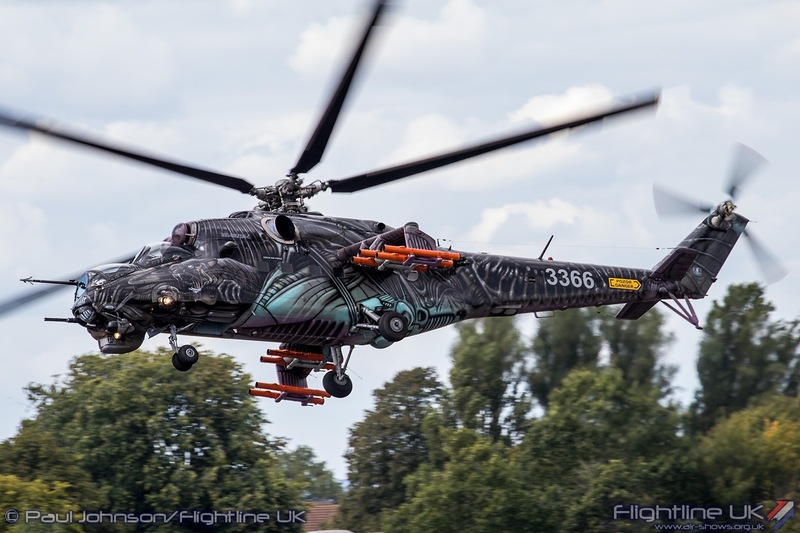 But it was the Czech Air Force that made the most notable contribution to the Festival of Flight. 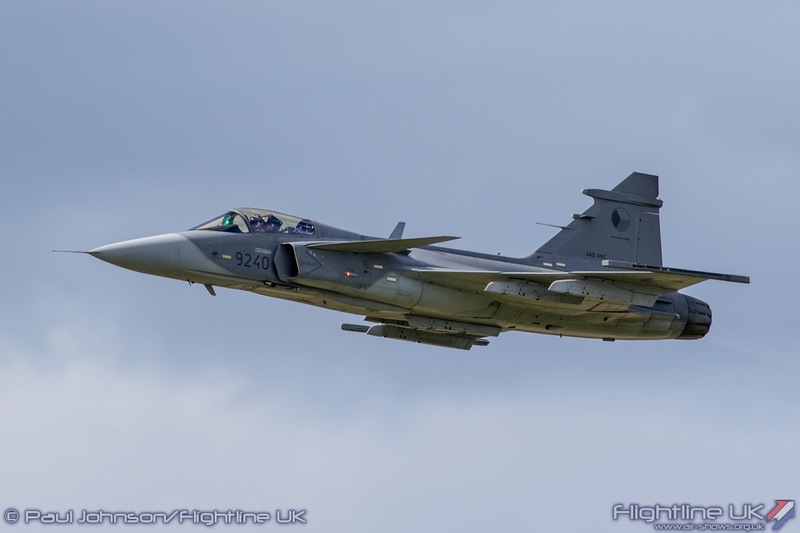 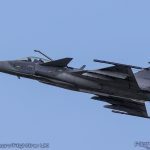 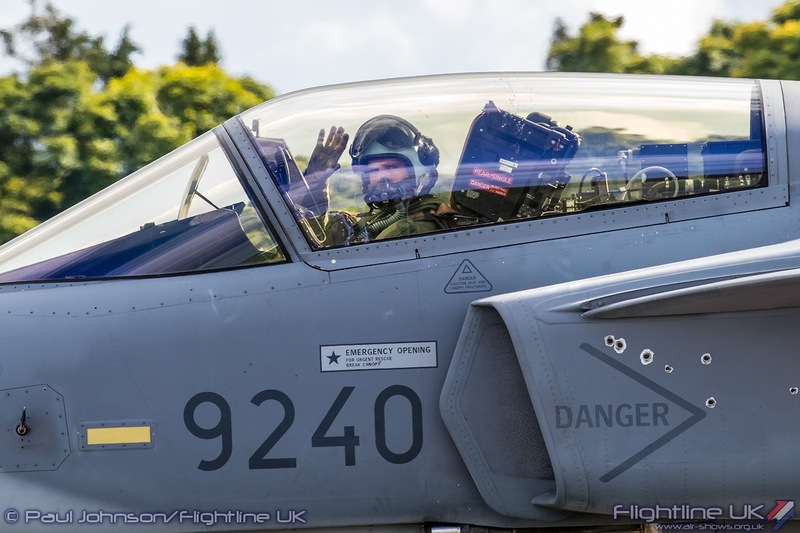 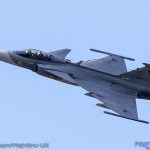 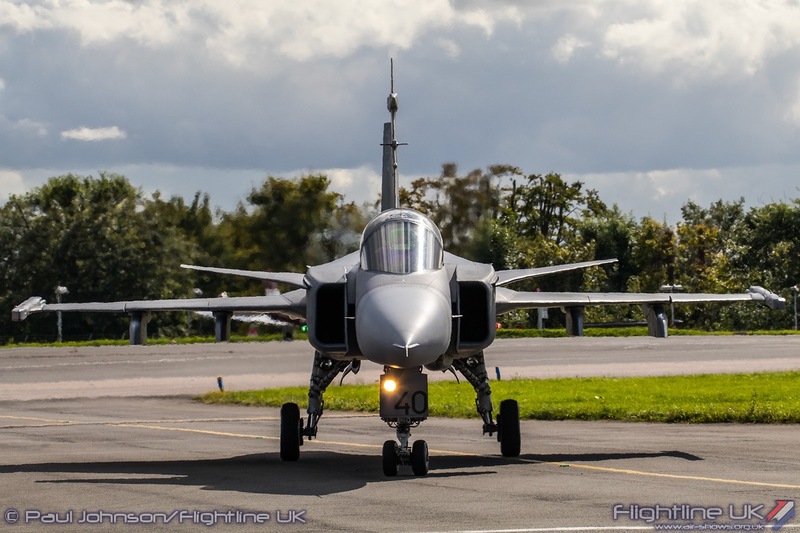 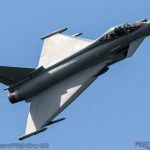 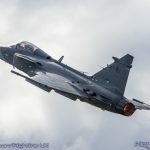 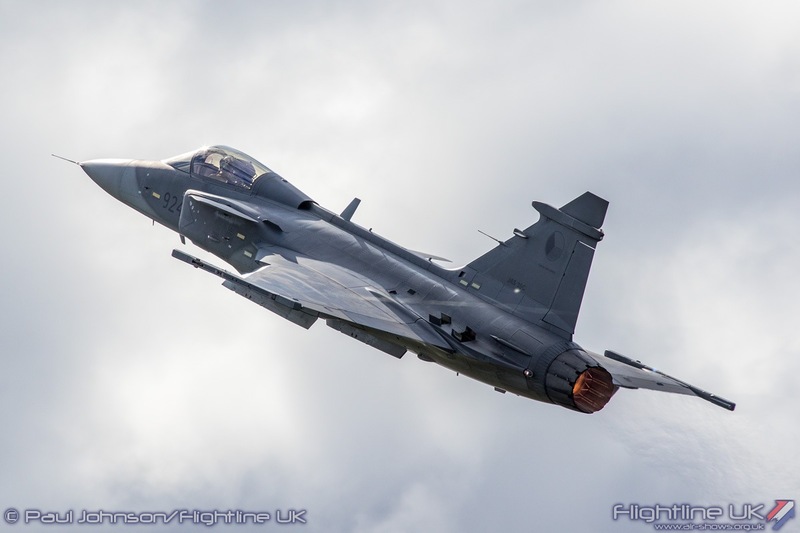 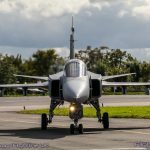 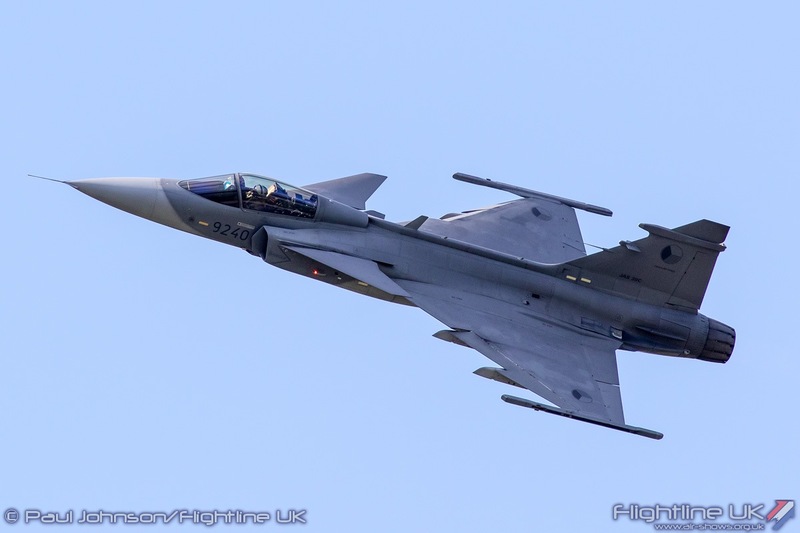 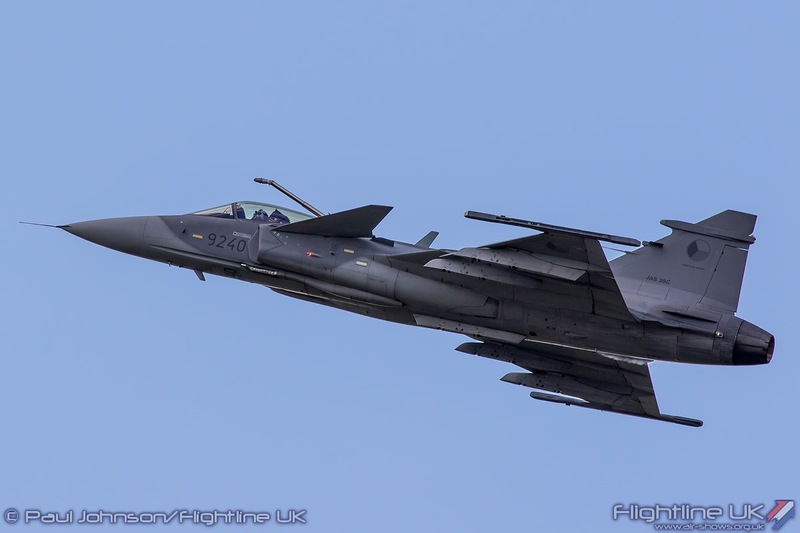 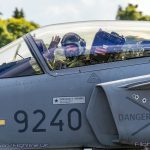 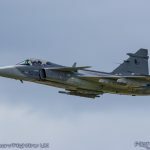 The air arm’s SAAB JAS-39C Gripen solo which was making its third UK appearance of the year marked the types Biggin Hill debut with an incredibly fast paced and compact display. 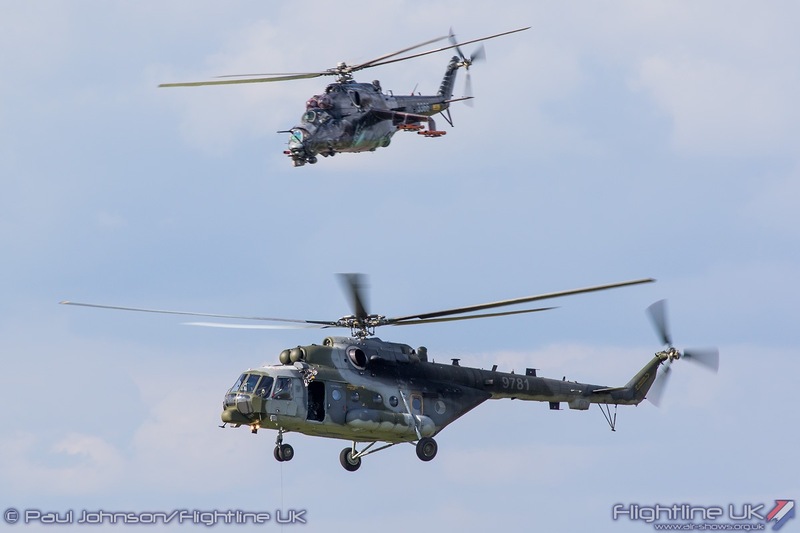 The stars of the show for many though were the pair of Mil Mi-24V Hind-D and Mi-171Sh Hip. 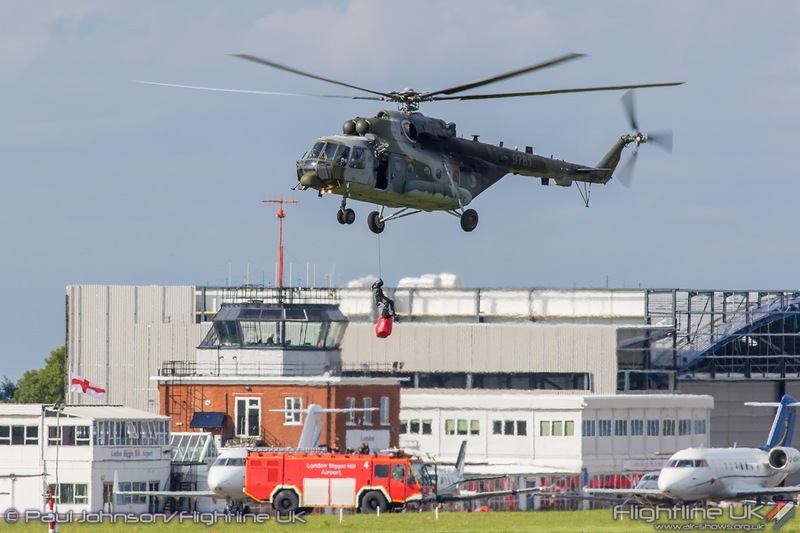 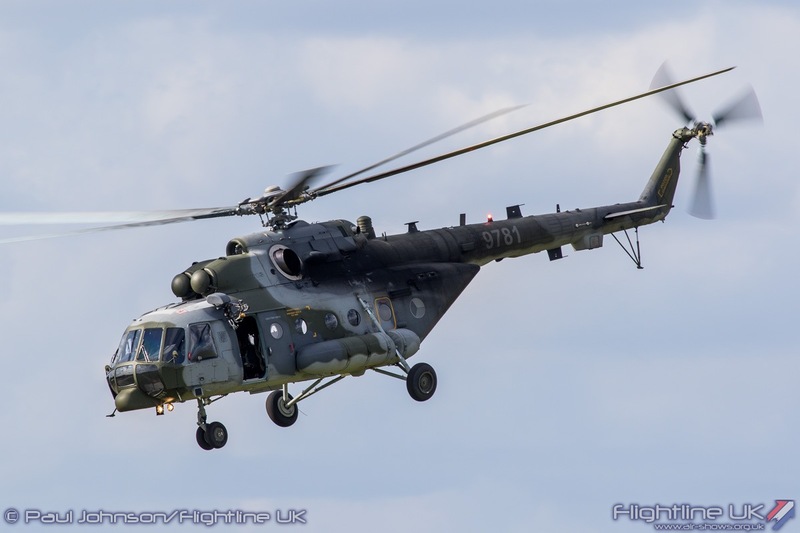 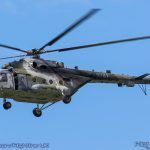 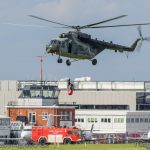 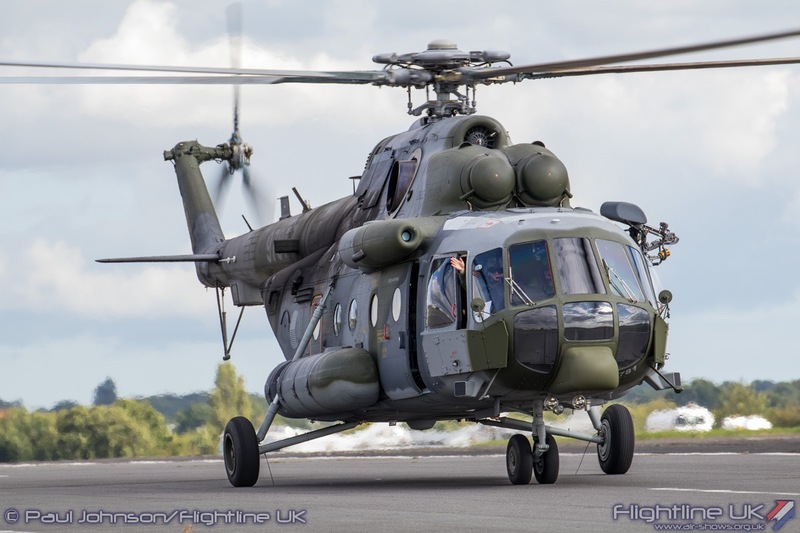 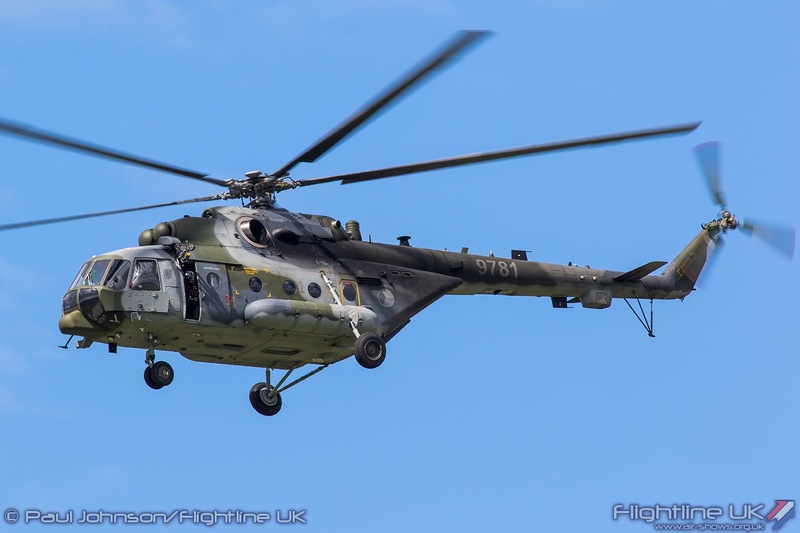 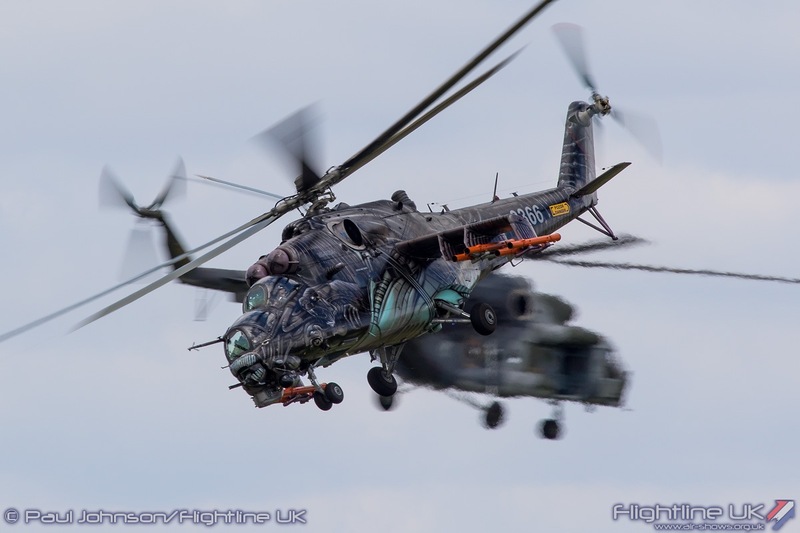 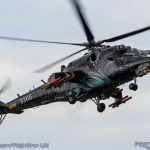 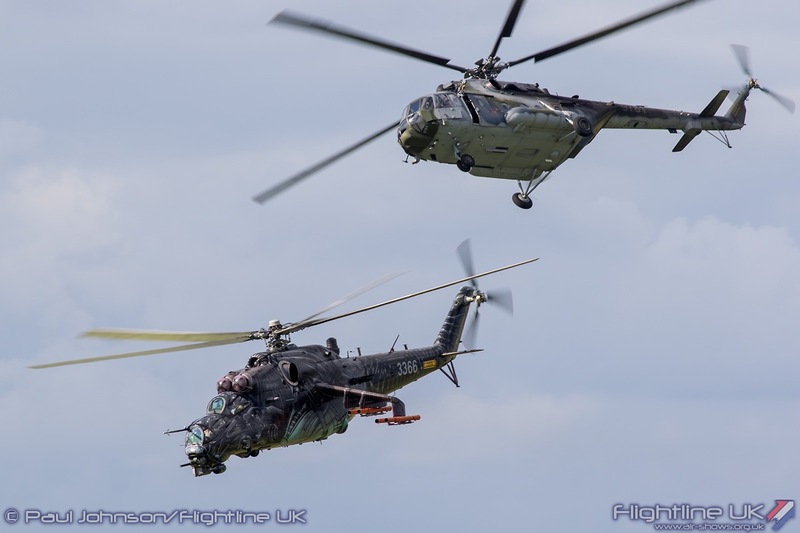 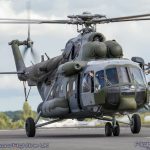 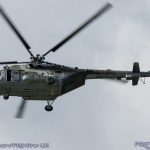 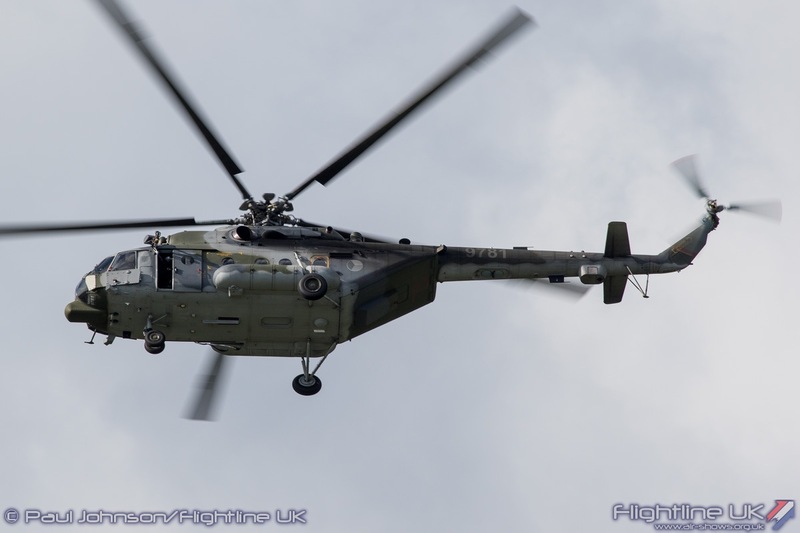 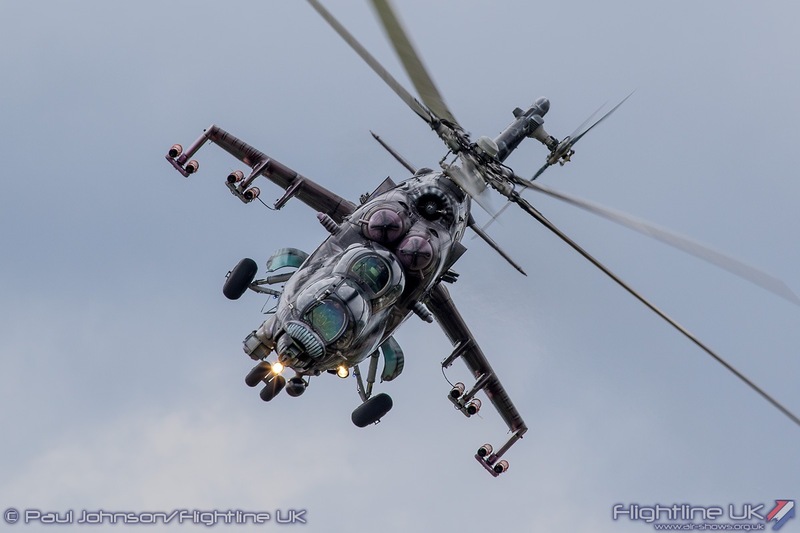 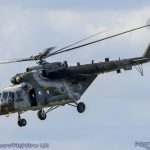 Whereas the Mi-24V has appeared by many UK shows before, including the 1995 Biggin Hill Battle of Britain Open Day, the Mi-171Sh was marking the types (including the older Mi-8 and Mi-17 variants) UK flying display debut in military hands. 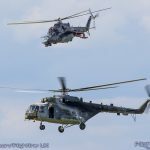 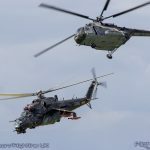 Together the pair of big Russian helicopters performed a Combat Search and Rescue role demonstration with the Mi-24V providing top cover as the Mi-171Sh located and recovered a simulated downed airman. 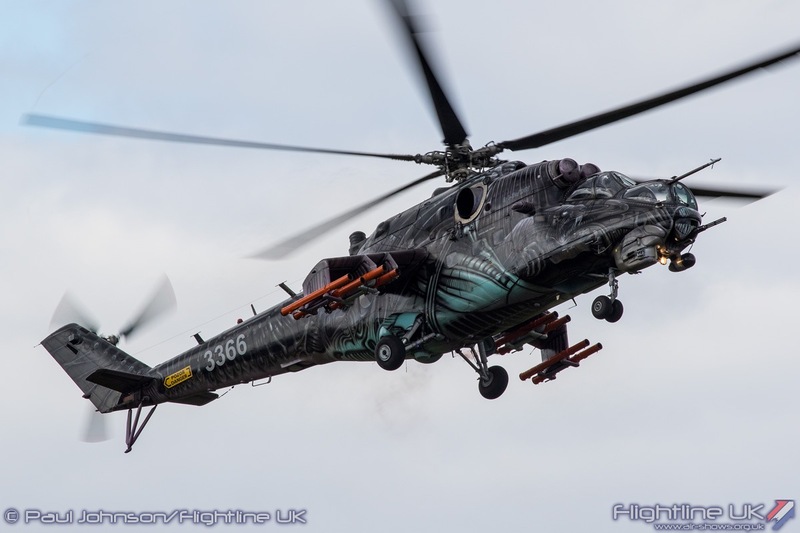 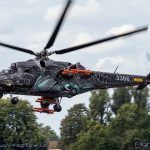 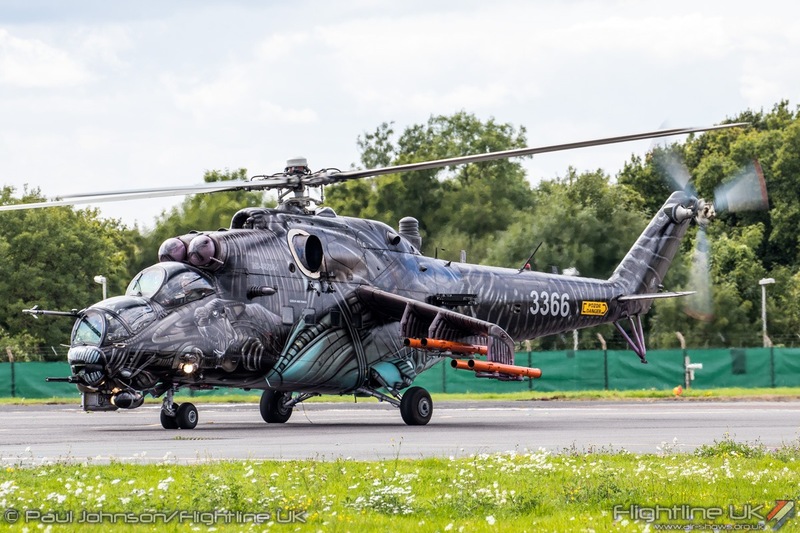 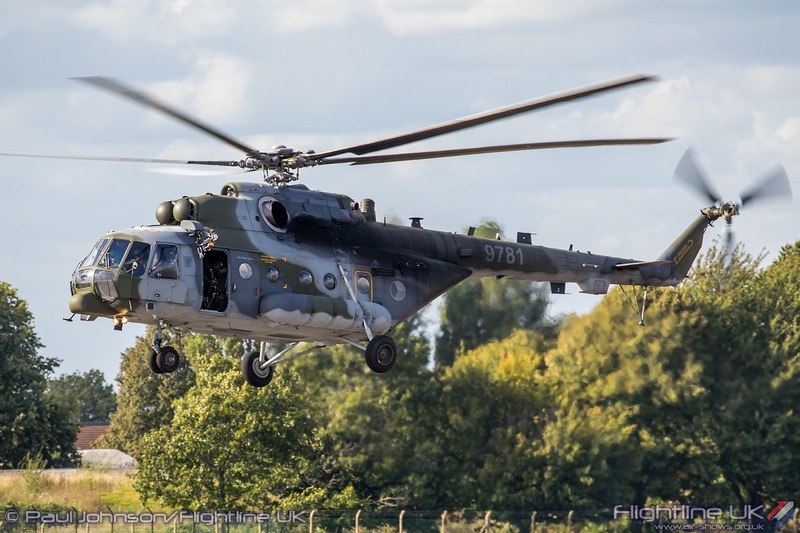 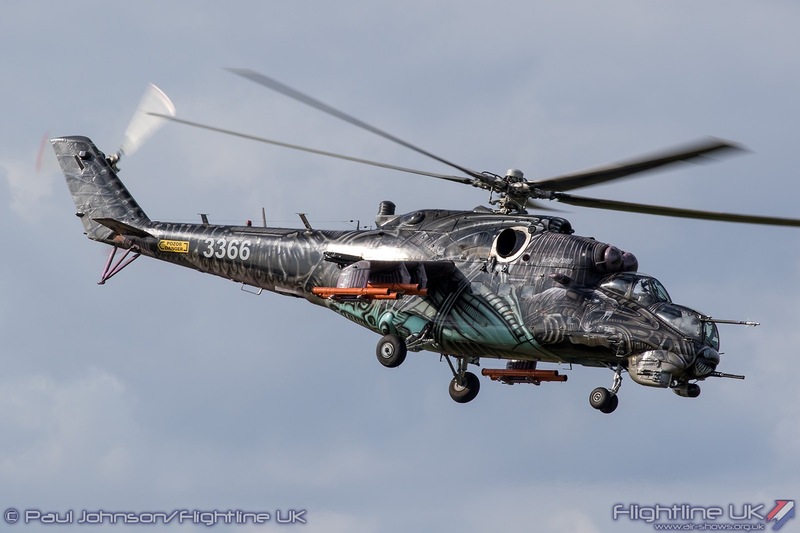 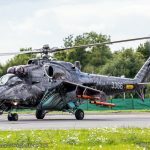 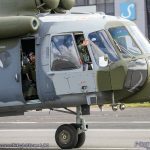 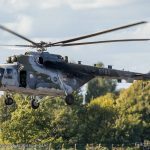 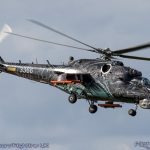 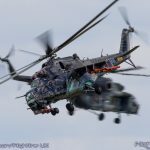 The Mi-171Sh appeared in standard camouflage but the Mi-24V was wearing a very sinister “Alien Tiger” scheme applied for this year’s Tiger Meet Exercise in France. 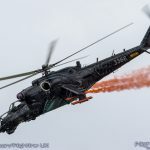 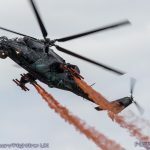 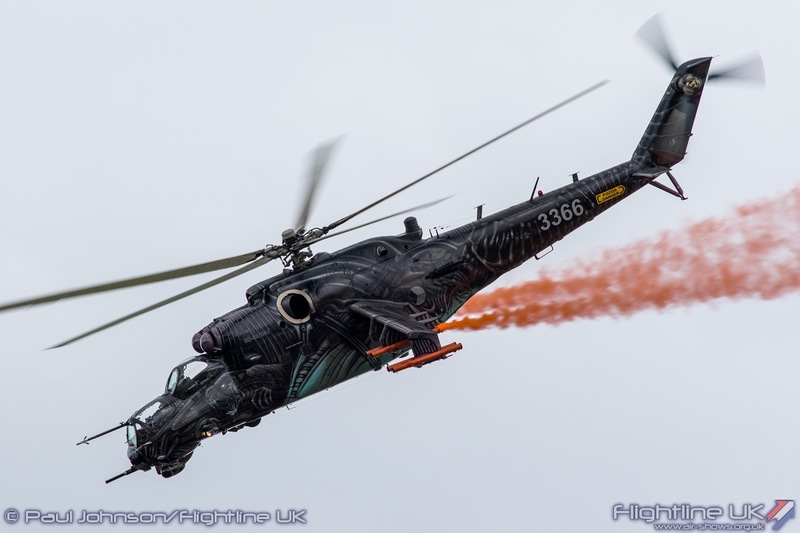 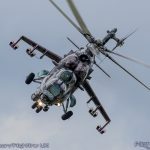 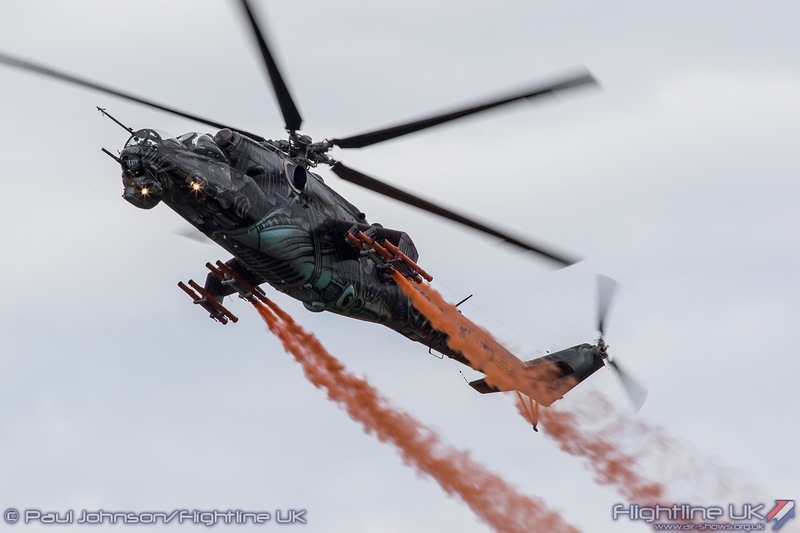 The Mi-24V also flew a dramatic solo display complete with smoke on both days which was a late addition to the flying programme filling a gap left by the cancellation of the Dutch Spitfire. 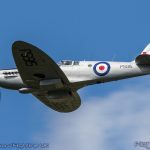 The 2017 Biggin Hill Festival of Flight was a really fun weekend. 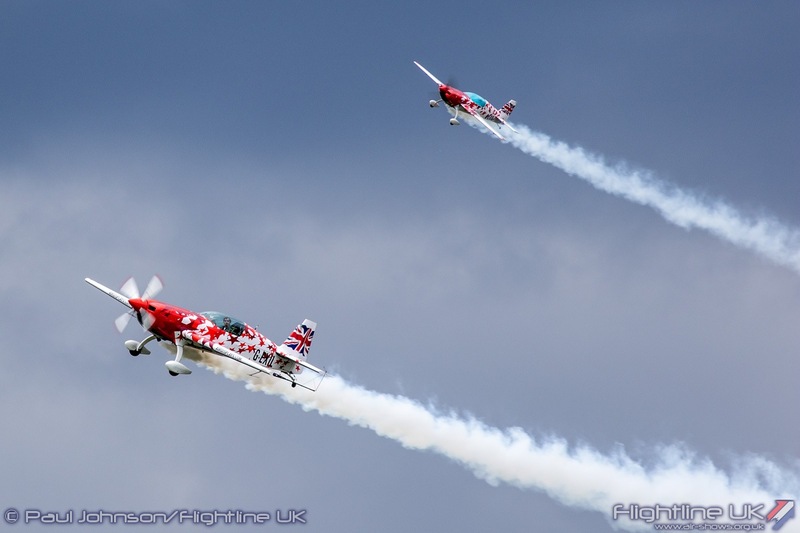 For the first time in four years, the weather was kind to Biggin allowing full flying programme on both days. 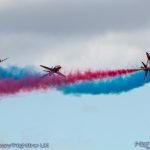 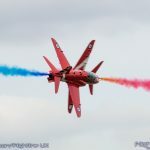 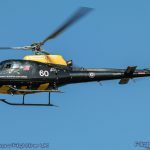 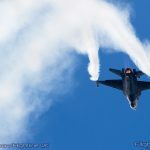 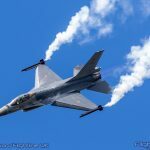 While it was a very different and smaller event to the Air Fair, it maintained a very high standard presenting some very exciting displays in a relaxed atmosphere which meant there was plenty of time to take in the full show.